Soon, I hope, when building the “nests” for our species (which impacts the nests of so many other species), the landscape will never be an afterthought. 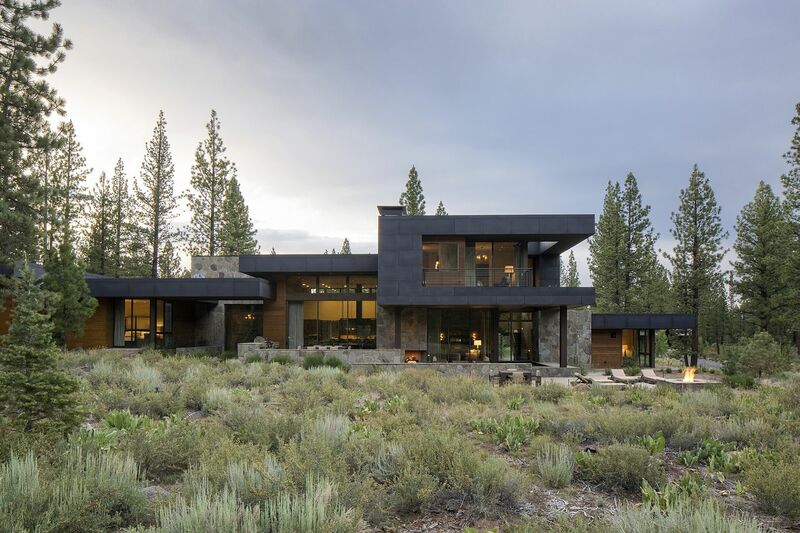 Searching through the portfolios, I did find a firm that included a “landscape” category: Marmol Radziner, with offices in Los Angeles, San Francisco, and New York. 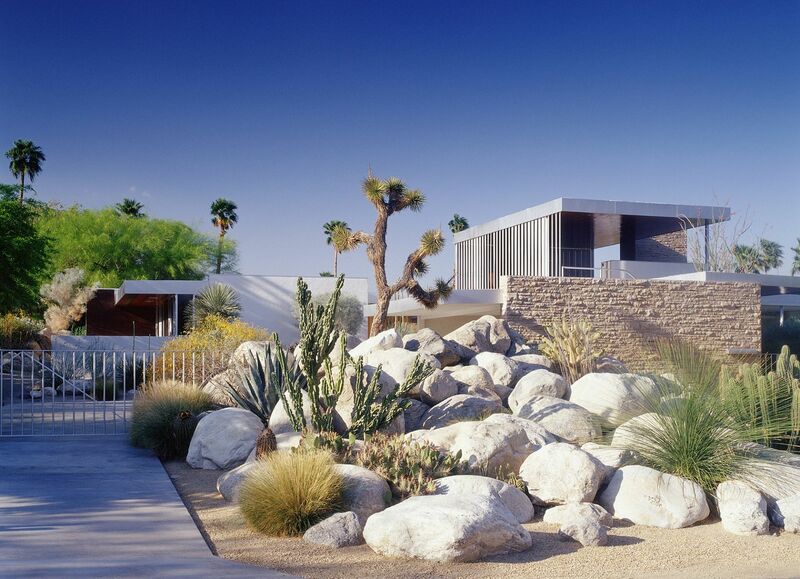 These photos are from their portfolio, including the above Kaufman house, Palm Springs, California. 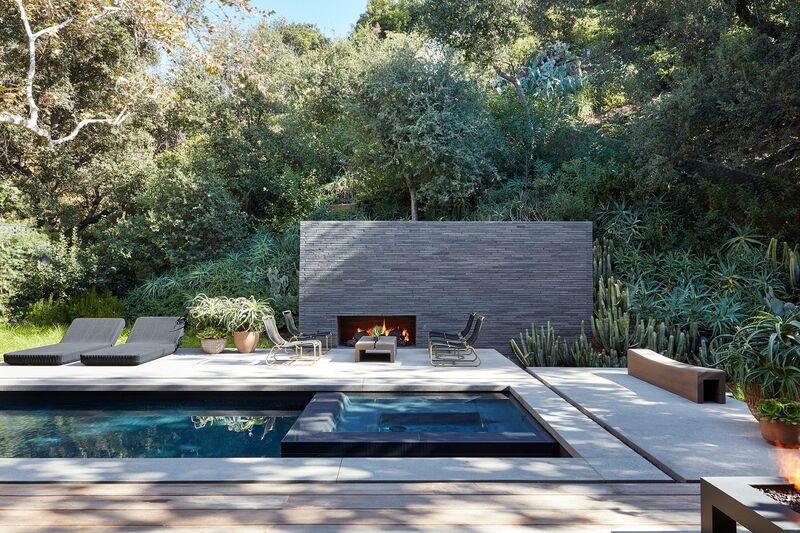 Levitt House, Beverly Hills, Calif.
Let’s emphasize the “outdoor” in “indoor-outdoor” for once. 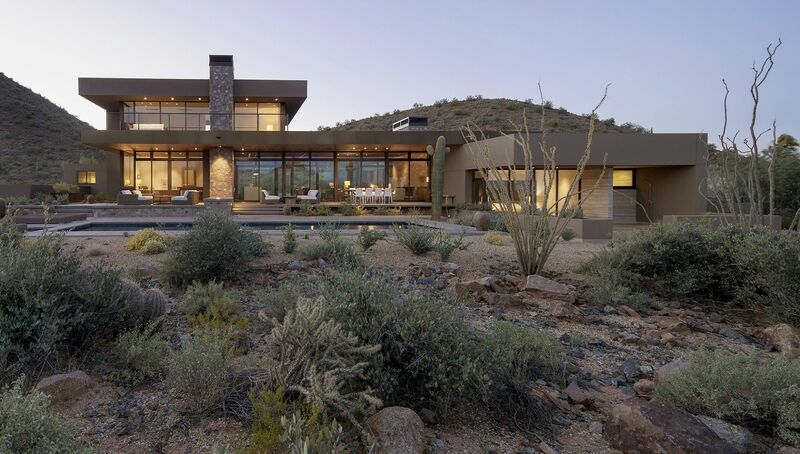 Let in the light, yes, but check out the shadows plants throw against walls, the seductive rustling of the wind in the trees, the myriad inspirational shapes and forms of plants — and the air cleansing and cooling effects they bring to our homes in summer, the wildlife they nurture year-round. 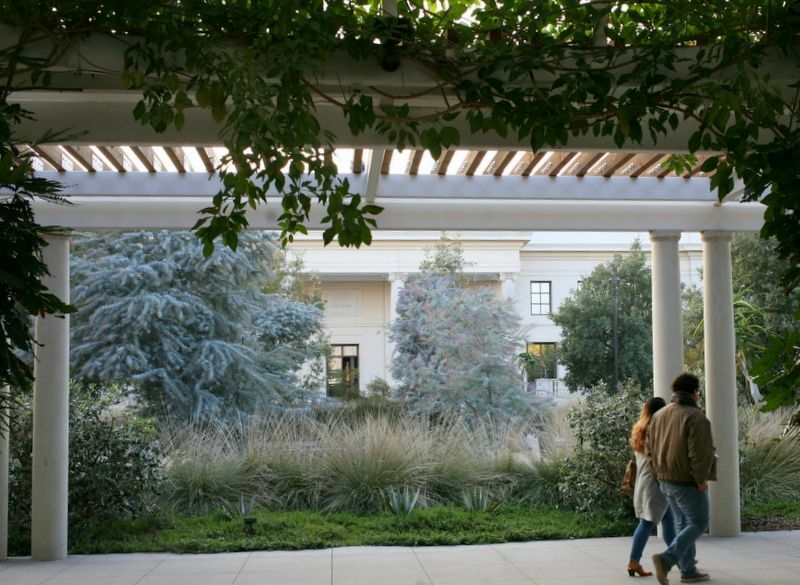 (And I include myself in that “wildlife.”) Here’s to a “Green New Deal,” where architecture and landscape architecture shake hands in 2019 and never let go! Of Ensete, Musa, and Musella, the three genera of bananas, I’ve grown just one. 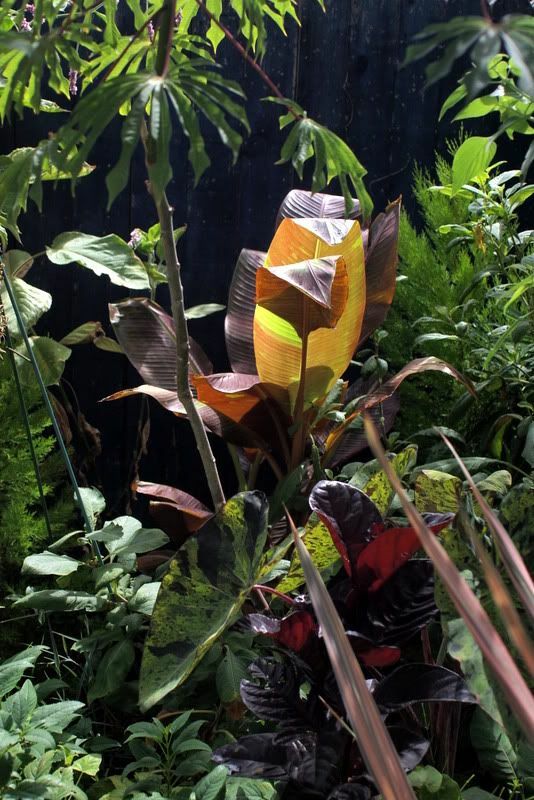 Above is Musa ‘Siam Ruby’ in more plentiful irrigation times in my garden around 2010 — just like the Dude’s rug, those big leaves really pull a garden together. Though I’ve only grown ornamental bananas, theoretically I could grow the edible kinds in my zone 10 frost-free garden, too, as my Vietnamese neighbor does, Mr. Le. We sampled one of his wonderfully plump, sweet, stubby bananas when it cropped in November, last month, definitely not a ‘Cavendish.’ Bananas are one of the most widely consumed fruits in the world and the No. 4 dietary staple after rice, wheat, and corn. If you’re cooking them, then they’re called plantains. But unless you have a zone 10 neighbor growing bananas as a seasonally fresh, garden-to-table fruit, your daily breakfast-cereal-with-banana ritual is in jeopardy. Predictably, the monoculture of the ‘Cavendish’ banana, “which a nineteenth-century British explorer happened upon in a household garden in southern China,” (New Yorker “We Have No Bananas“) is producing the same fate as that which befell the previous top banana, ‘Gros Michel,’ last grown in the 1950s. Monocultures never end well; exhibit 1, Ireland’s Great Potato Famine. Vegetative clones have no means to adapt to diseases and pests — when disease kills one, it’s effectively killed them all. It’s just a matter of time. While the ‘Cavendish’ was never the most tasty banana around, it became the number one export banana due to its amenability to shipping and the use of ethylene gas to control ripening. (My dad told us blood-curdling stories of the epic banana spiders he encountered when unloading the fruit from cargo holds in LA Harbor, San Pedro, Calif, just a few miles away.) It’s taken over half a century, but the seedless, sterile, vegetatively propagated Musa acuminata ‘Cavendish,’ once impervious to the deadly fusarium wilt known as Panama Disease that wiped out ‘Gros Michel,’ is succumbing to a potent mutation, Tropical Race 4. TR4 has already infected banana plantations in Asia and Australia but has not yet made a beachhead in Central America, home to the OG neocolonial “banana republics” of the United Fruit Company But that day is inevitable. I don’t know about you, but this is bad news in our house. I doubt Marty would get out of bed if there weren’t bananas in the house. 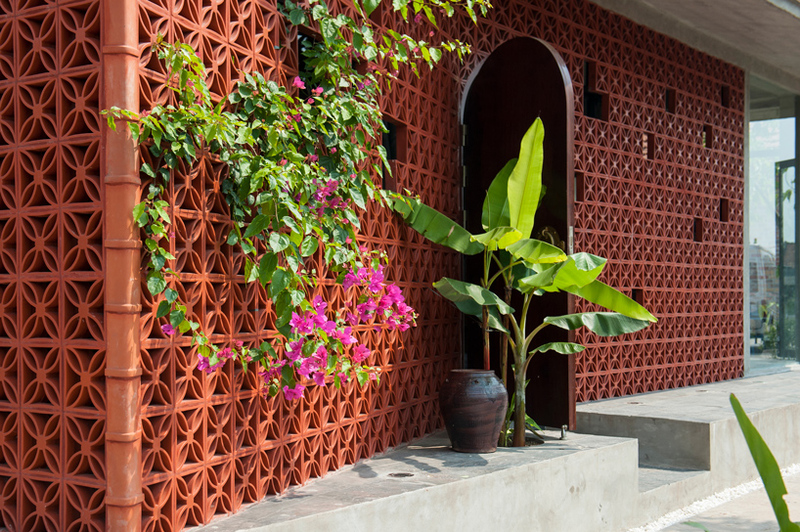 I love the use of breezeway block on this Vietnamese house featured by Design Boom. 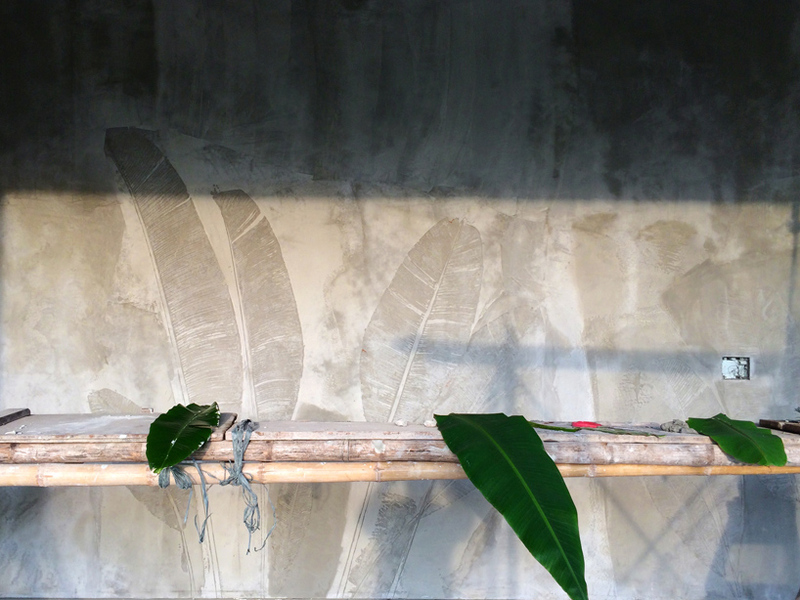 But it’s the inside walls imprinted with banana leaves that started me thinking about our long-standing love affair with bananas and what we’ll do if/when the ‘Cavendish’ fails. 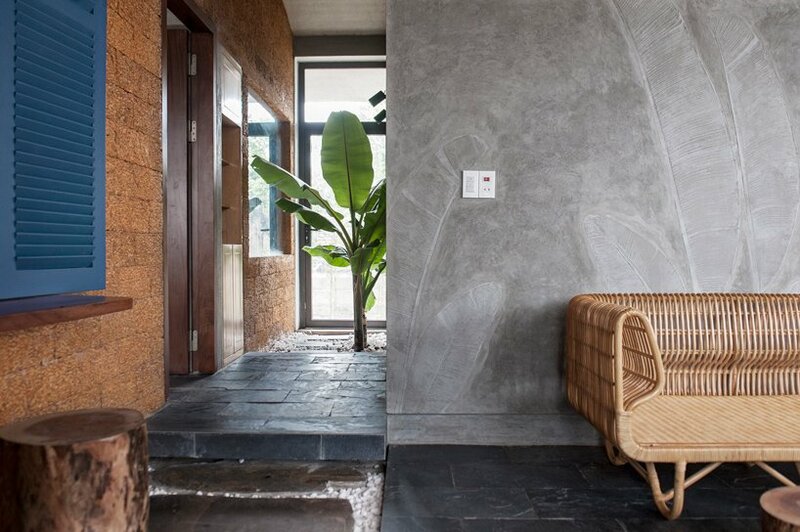 Bananas are understandably revered here — it’s thought that they have been cultivated in the Mekong Delta for over 10,000 years. 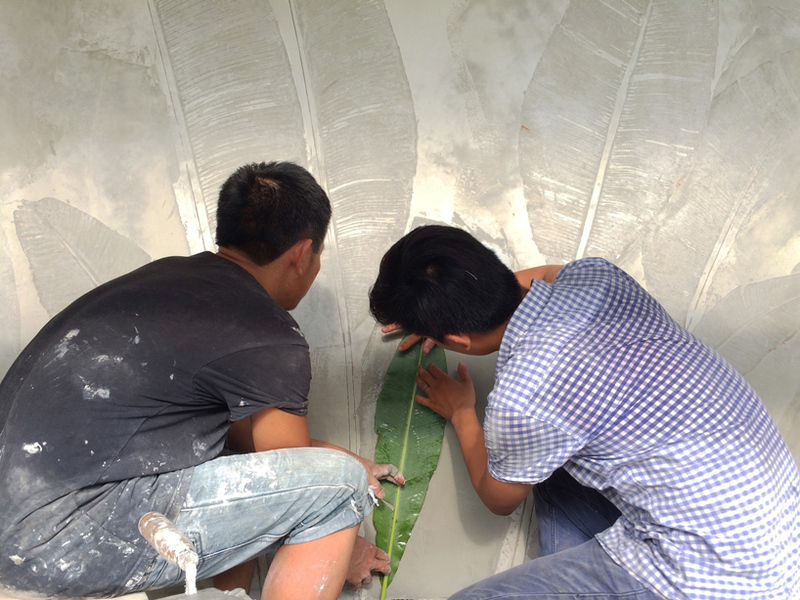 Viet Nam exports around 1.4 million tons of bananas annually. Even though it can grow to tree-like proportions, the banana is an herbaceous perennial, one of the largest. Mr. Le’s plant is easily 15 feet tall. I wish I knew the variety of banana that Mr. 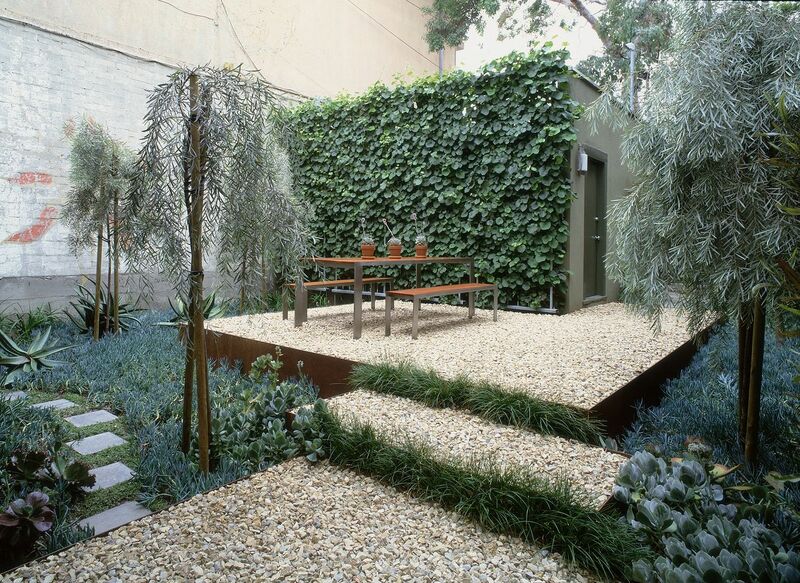 Le grows next-door. It really has a much better flavor than the ‘Cavendish.’ Of the millions of tons of bananas produced every year, just 20 percent are exported. The rest are eaten locally. But the huge export market of the commercially produced ‘Cavendish’ variety is so interwoven into so many countries’ economies and such a big part of so many breakfast tables, that its demise is unthinkable. Unthinkable but, apparently, inevitable. 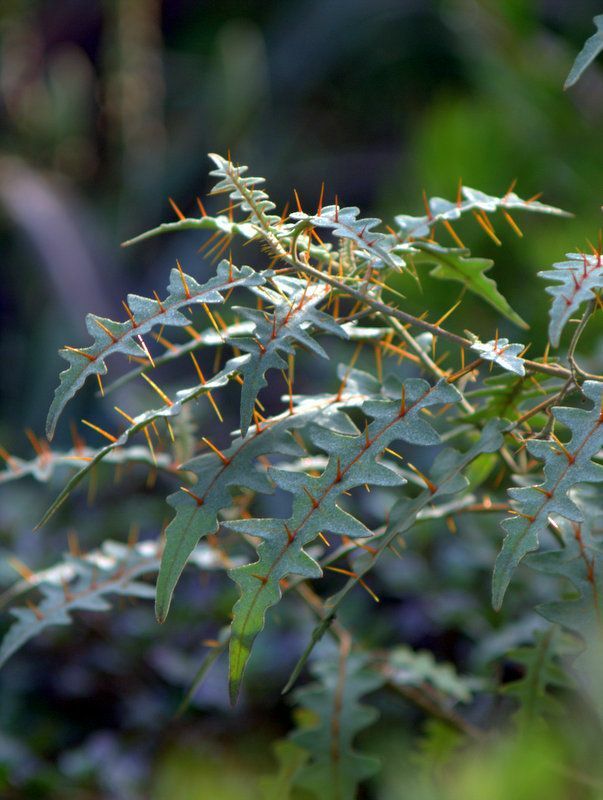 I noted Solanum pyracanthum on sale at nurseries in late summer, which makes sense for this heat-loving tropical from Madagascar. 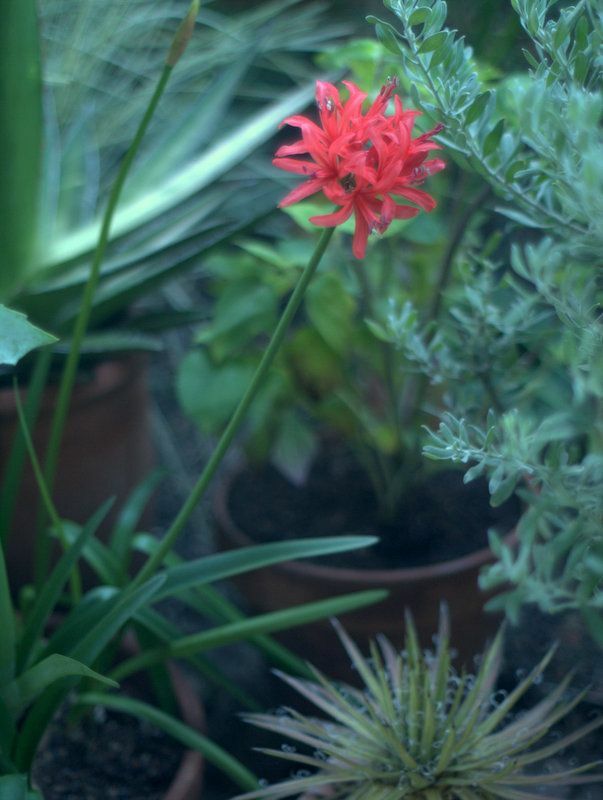 (Except when it’s not a heat lover, like at this moment in December when it’s thriving in my garden. What’s up with that?) Densely leafy and compact at the nursery in August, they were the antithesis of my one lanky, self-sown specimen at home, which I kept pinching back to encourage branching and more heft. Now the “Porcupine Tomato” is arching elegantly over a clump of Euphorbia mauritanica that just might bloom this spring, and I’m reconciled to its lanky ways. It’s won me over this December, a month when every effort made by the garden is appreciated. The low light catching the marmalade-colored thorns doesn’t hurt either. The solanum is one of those tender perennials (remember “temperennials?”) like the castor bean plant that ignores the seasons here in Southern California and can persist all winter. But unlike the raggedy castor bean, this solanum is actually looking pretty good. 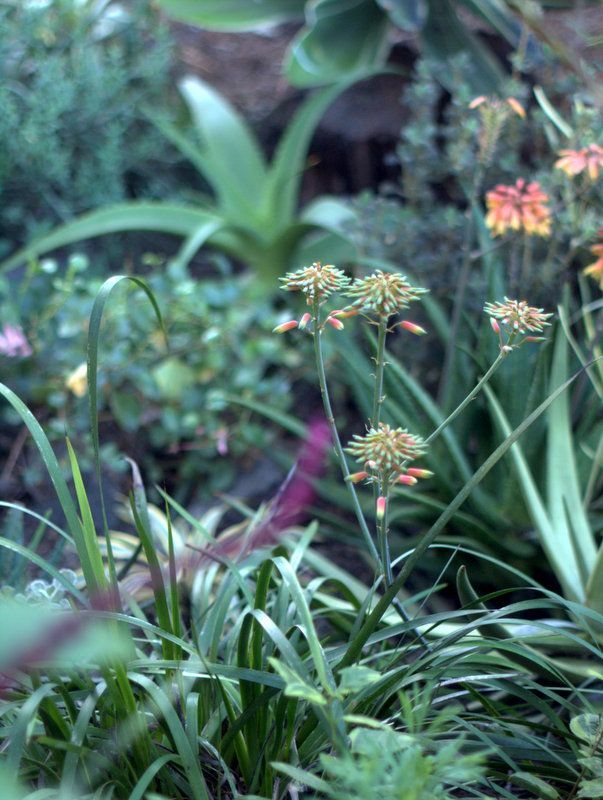 In summary, a tender perennial that wants the hottest spot you’ve got in your zone 7 summer garden is happy with the short days and cooler nights in a zone 10 winter garden. Which just goes to show that plants continually shrug off the rather arbitrary categories we assign them, like my happy-in-December Porcupine Tomato. Growing is knowing. 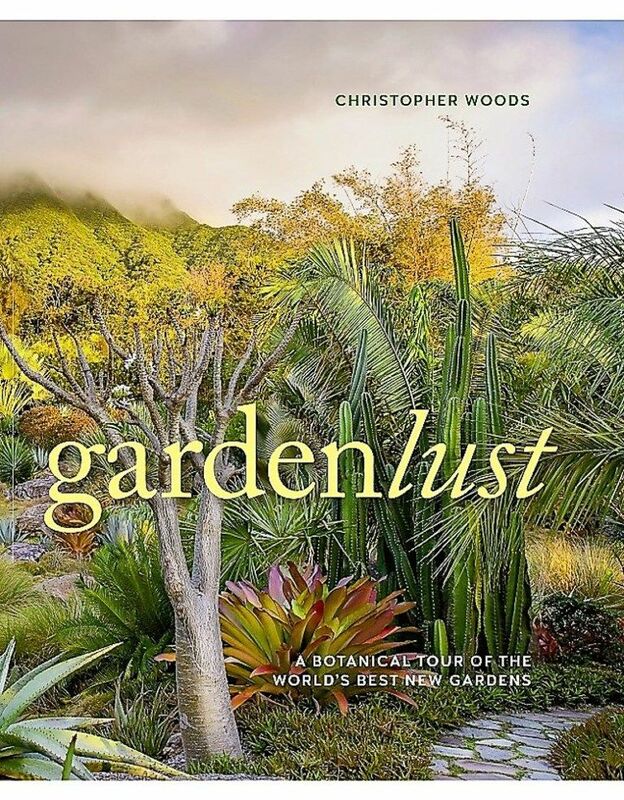 One of the items on my wish list this holiday is the recently published book Gardenlust by Christopher Woods. And what better way to vet a book than to hear the author himself describe it, which I was able to do at the Huntington on the 12th of this month, a free lecture at Rothenberg Hall. 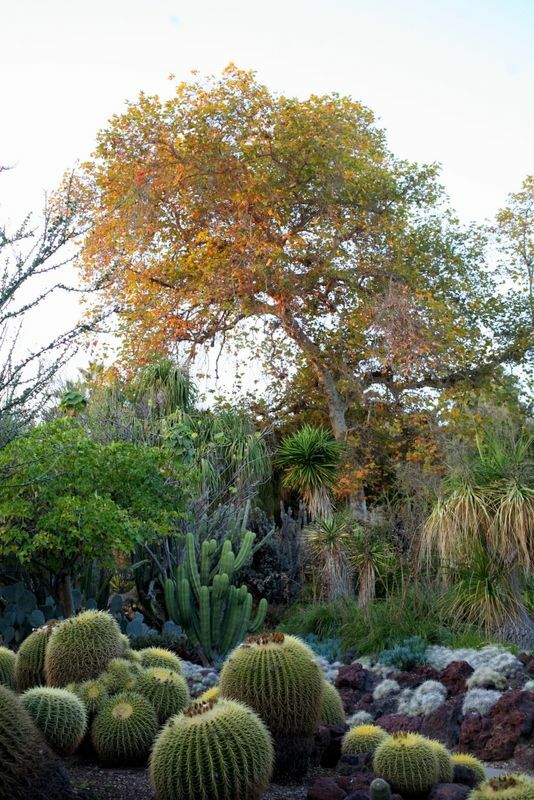 From his introduction, I gathered that Christopher Woods and Jim Folsom, Director of the Huntington Botanical Garden, go way back, having met most recently at a botanical garden in Puerta Vallarta that I believe is covered in the book. 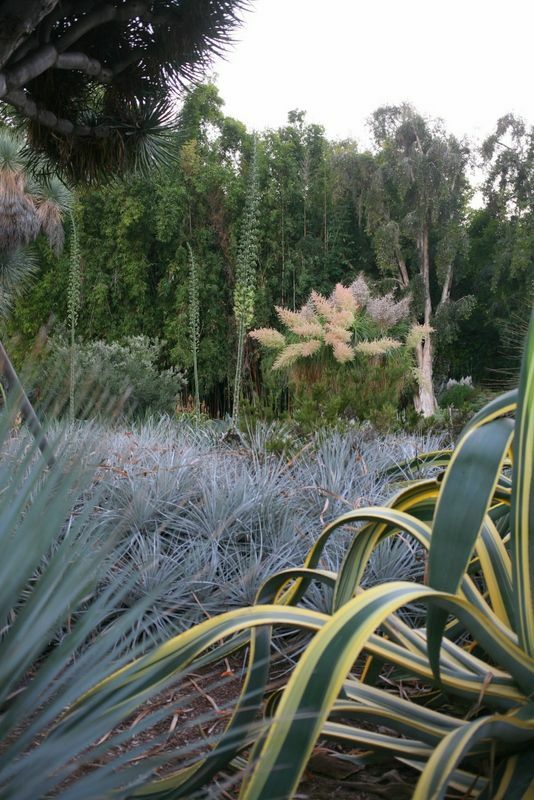 It was nearly dusk when the lecture finished, just enough time to race into the Huntington’s desert garden for some photos, the perfect opportunity to indulge in some gardenlust of my own. 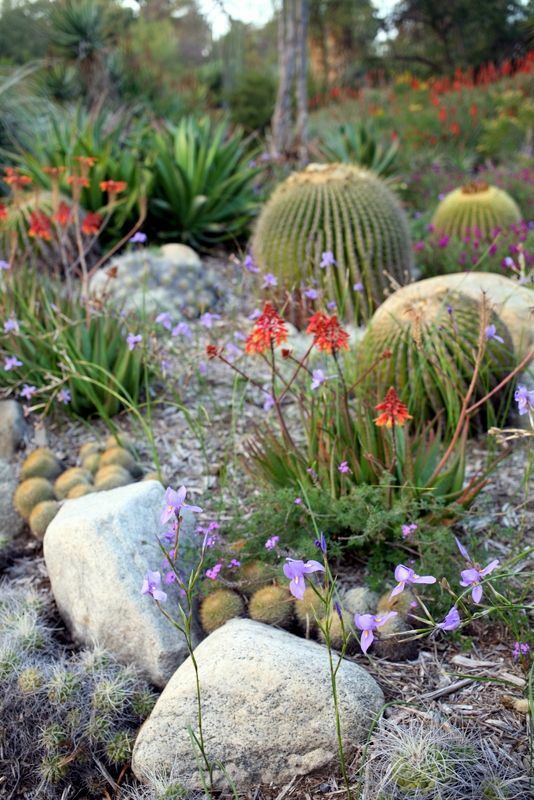 The recent rains have rendered the desert garden even more glorious than usual. For the gardeners of the world. You with the crazy eyes and rough hands. You who are so much in love with growing things. You artists and scientists, poets and painters, protectors and advocates. You who fall in love again and again. Mr. Woods has been involved in gardens for 45 years, having grown up in a working-class London neighborhood in the “swinging Sixties,” taking a break from his band for a summer job at Kew and then never looking back. He’s worked at Bateman’s (home of Rudyard Kipling — and we just recently screened The Man Who Would Be King again so this resonated), worked with Graham Stuart Thomas, but ultimately grew restless with “British stuff” and headed to the U.S. Chanticleer to be exact. 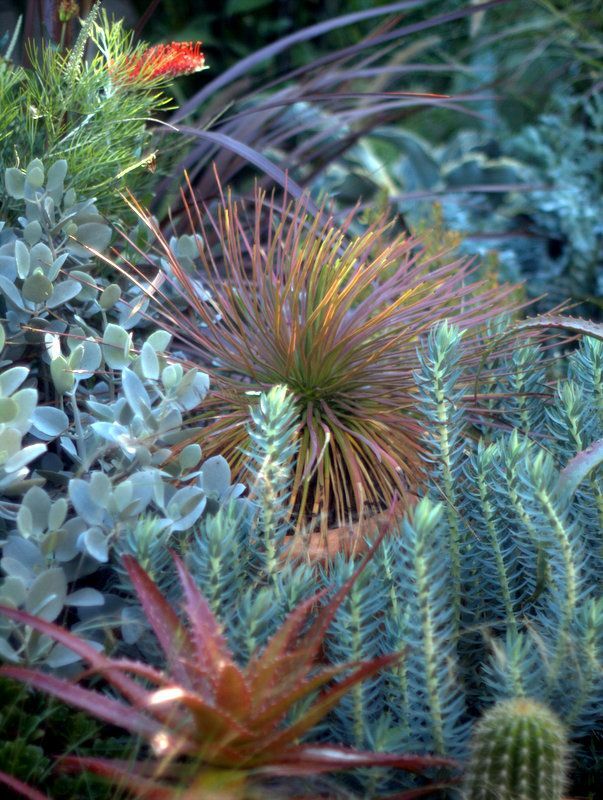 And there were several botanical garden directorships after Chanticleer, including the Mendocino Botanical Garden. 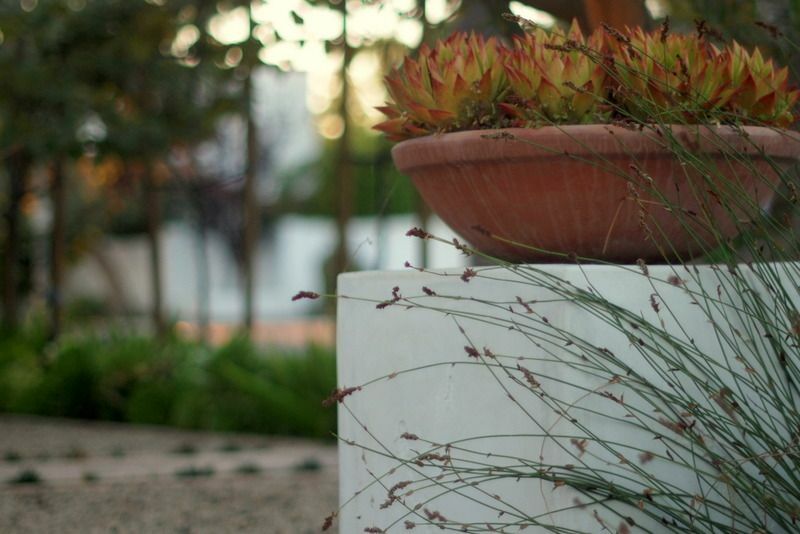 The book is the culmination of a career in public horticulture. 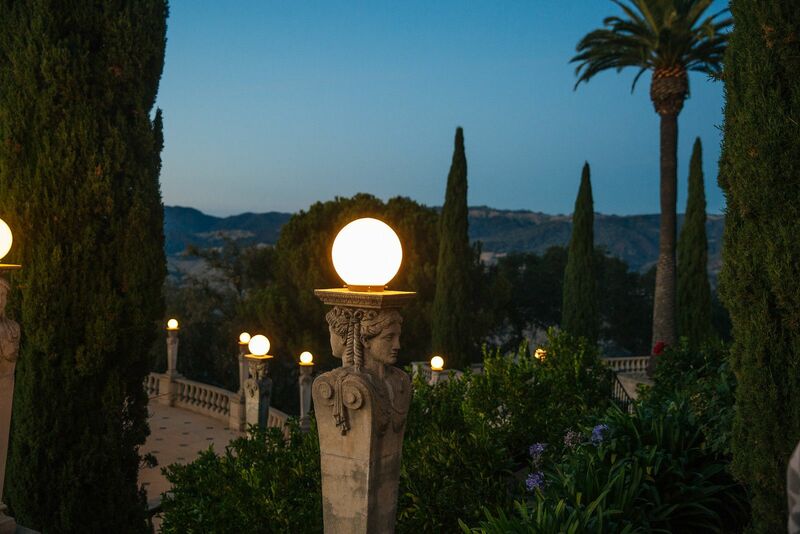 In other words, his horticultural “social capital” is vast, his contacts extensive, and he knows who is doing the interesting stuff in garden making — or knows someone who knows. 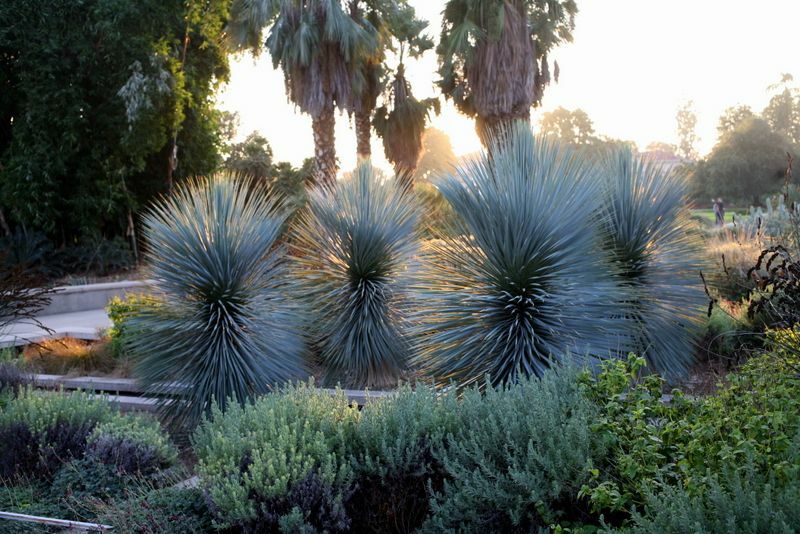 There are familiar gardens in the book like Sunnylands in Palm Springs, but I had no idea there was a little public garden in Las Vegas as well. If you missed this talk, fortunately you can hear Mr. Woods speak at Modernism Week this February. 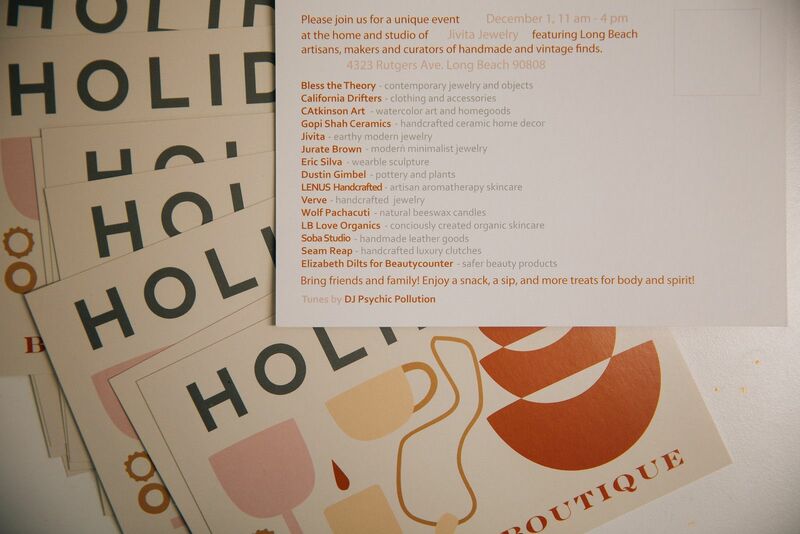 You’re motivated and ready to tackle this holiday business head on and get an early jump on shopping, but you’re shying away from all that mousey click, click, clicking and maybe more interested in combining shopping with some fresh air, congenial company and some nicely curated hand-made wares? Here you go. And it’s tomorrow! December 1, 2018, 11 a.m. to 4 p.m. 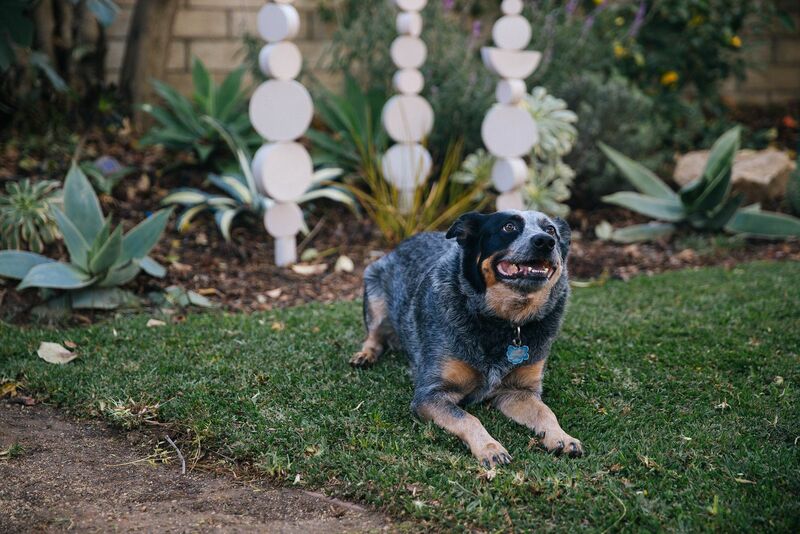 Clothing, ceramics, watercolors, pottery, plants, skincare, beeswax candles, leather goods, tasty treats, a DJ…and there’s a blue heeler too? I’m all in. And what’s that he’s heeling in front of? 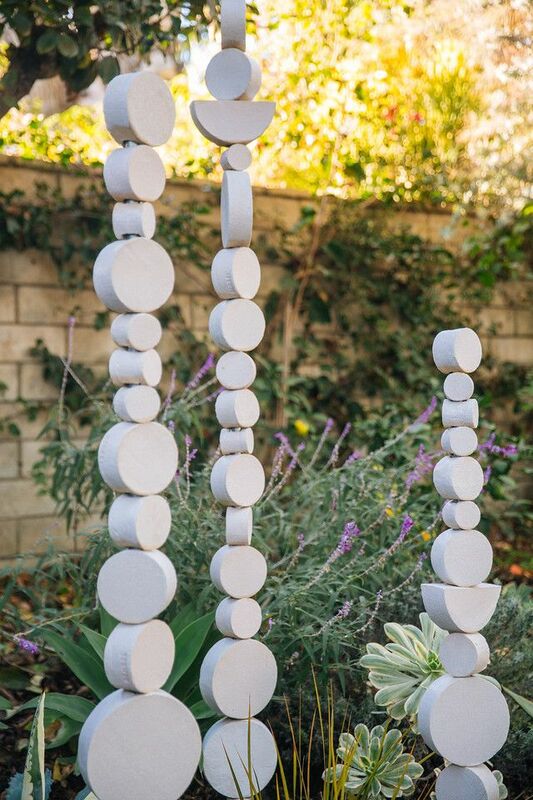 That would be ceramicist and garden designer Dustin Gimbel’s “Lunar Spires” — tomorrow would be the perfect opportunity to make an appointment with him for your own personal installation of towering spires for the garden. 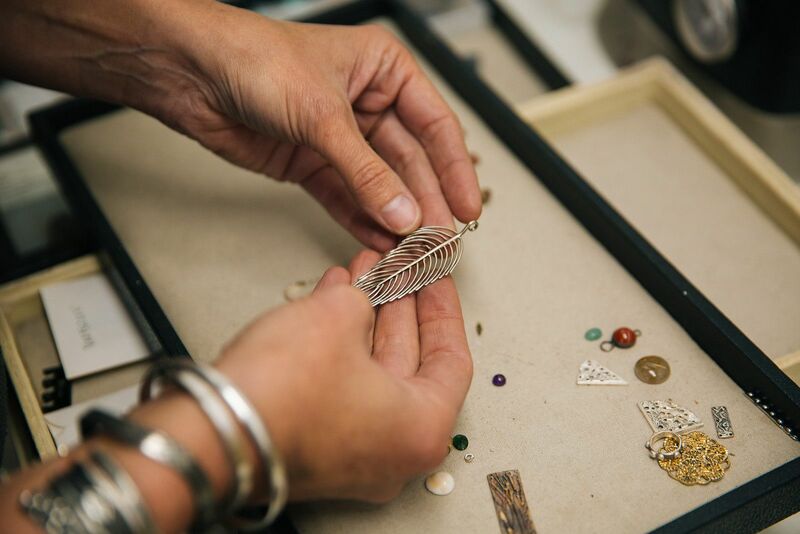 Because you know you want to put it at the top of your holiday wish list. 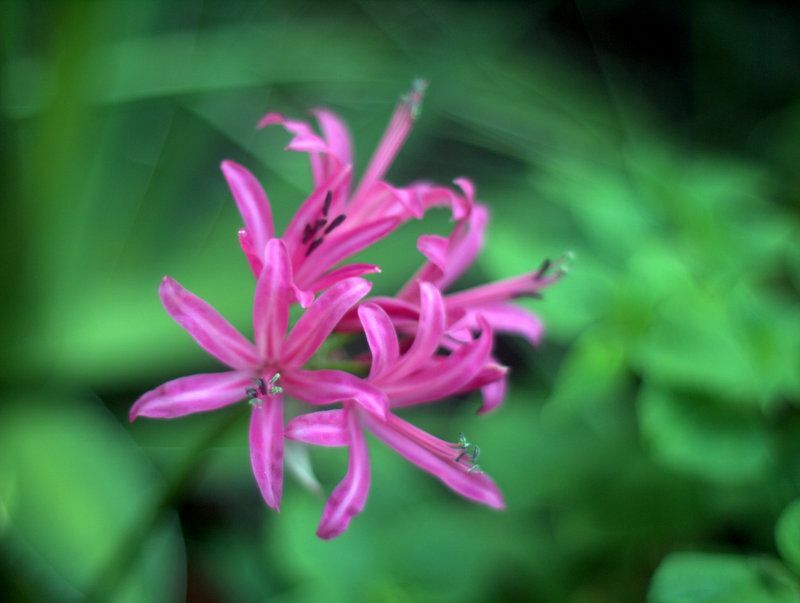 What is up with the lack of interest in nerines in the U.S.? 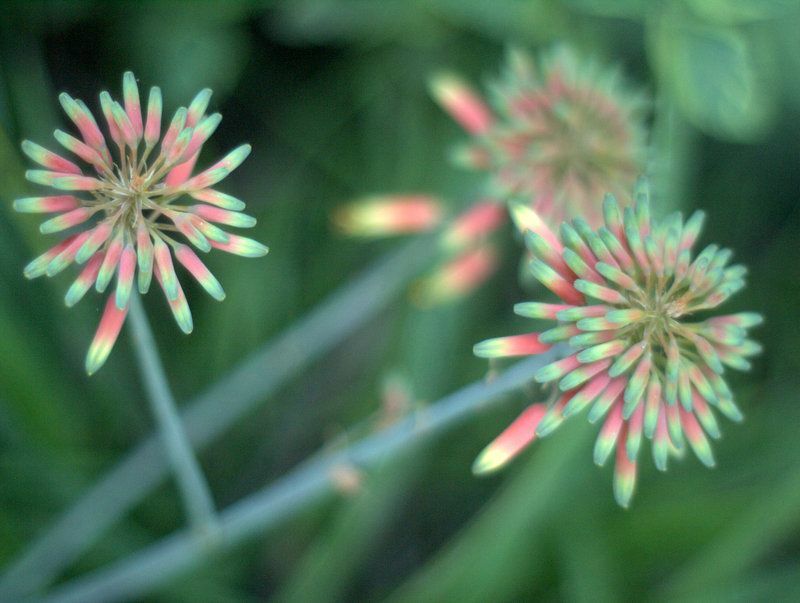 They have long, cuttable stems, the blooms last much longer than tulips, as in weeks rather than days, and they flower at a time of year when something so fresh and delicate and saturated in color and intricate in shape seems too good to be true. And, unlike tulips, they multiply and return every year. And all that beauty for so little effort. 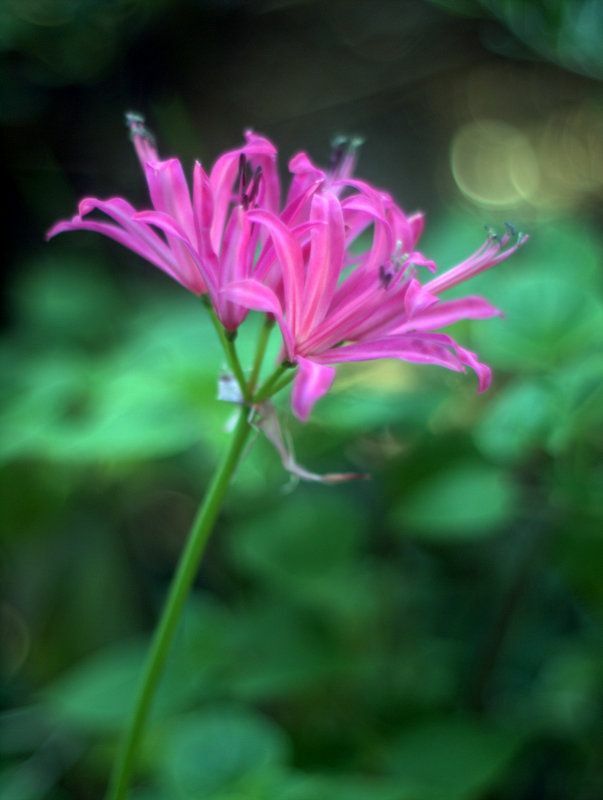 Even a complete newb to nerines like me can get them to flower — they’re that easy. I keep the pots dry all summer, an unfortunately easy task during our rainless months, and then water them when the leaves begin to show in fall. 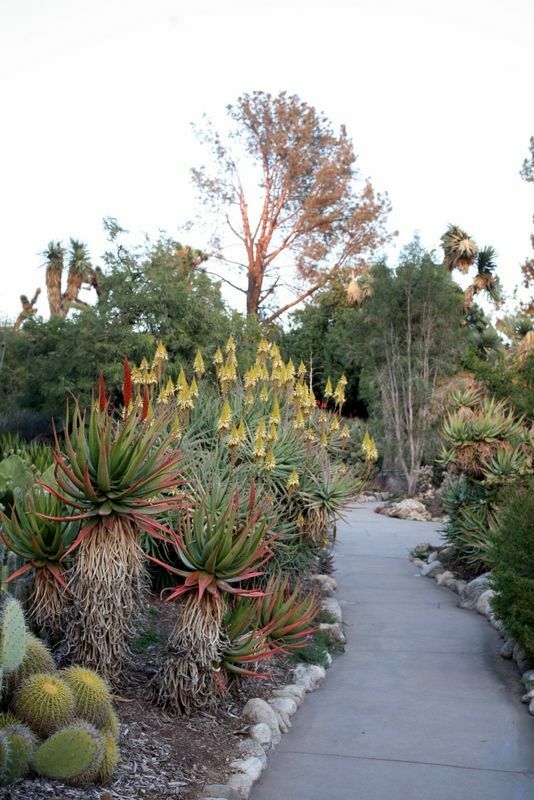 Here in Los Angeles they’re fine outdoors year-round, whether in the ground or in pots, but these bulbs from South Africa are typically grown in greenhouses. 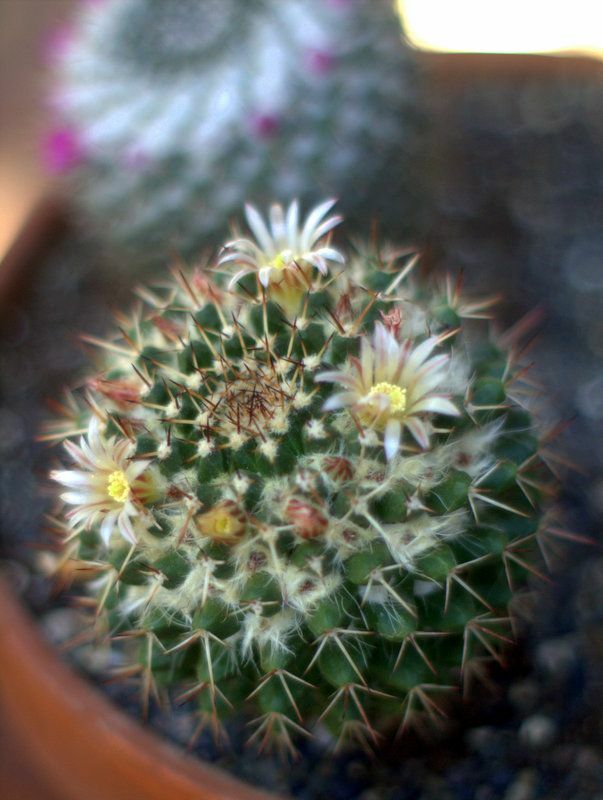 From the flamboyant to the understated, today being the 15th of November aka Bloom Day, the tiny blooms on some potted mammillaria deserve mention. Still in the grips of the fall planting frenzy, to wit, late afternoon yesterday I climbed up in the lookout for some reading. But mostly I just scanned the garden and ate pistachios because the cat was dozing on my reading material. 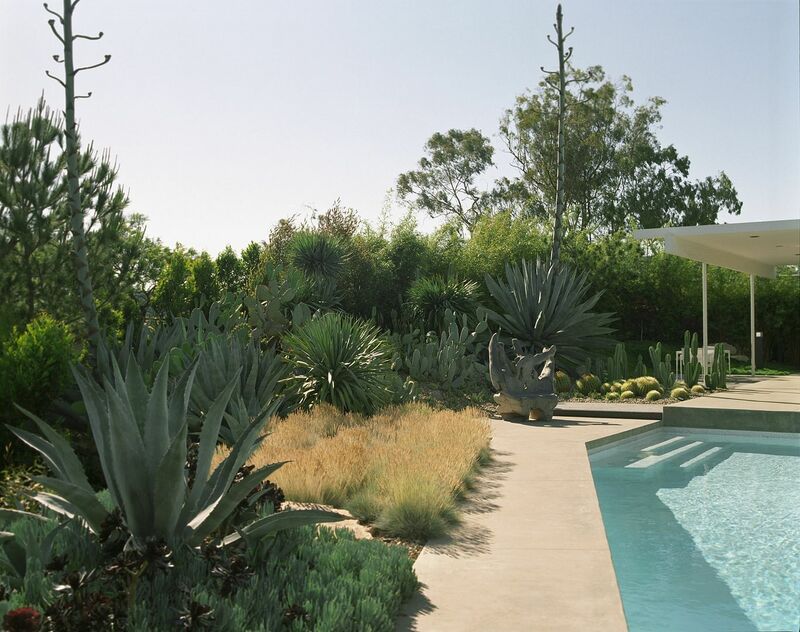 From that lofty vantage point, it became obvious that the garden would be much improved by taking out a couple soft plants and adding in their place the currently pot-grown Yucca linearifolia. The deed was quickly done before sundown, probably a little too quickly (fingers crossed the yucca pulls through), and early this morning my first thought was of that large, tantalizingly vacant container. 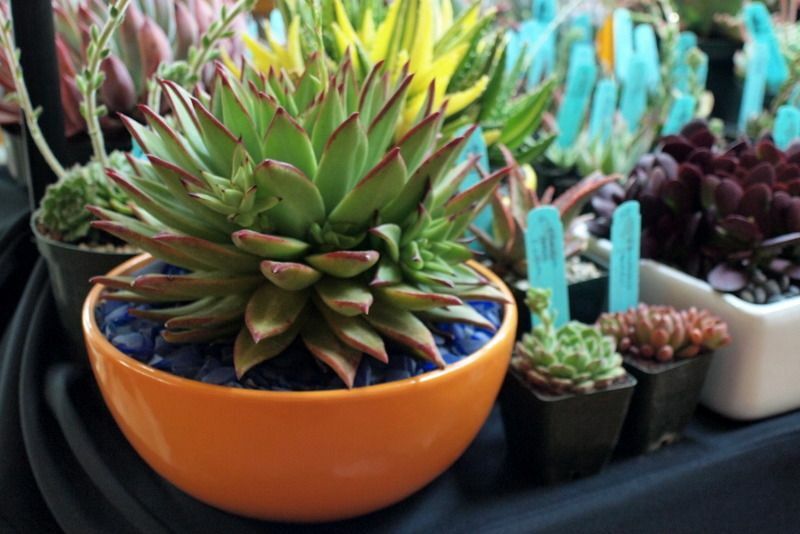 Something new, big and bold would have to be brought home from the nursery! That was my second thought. 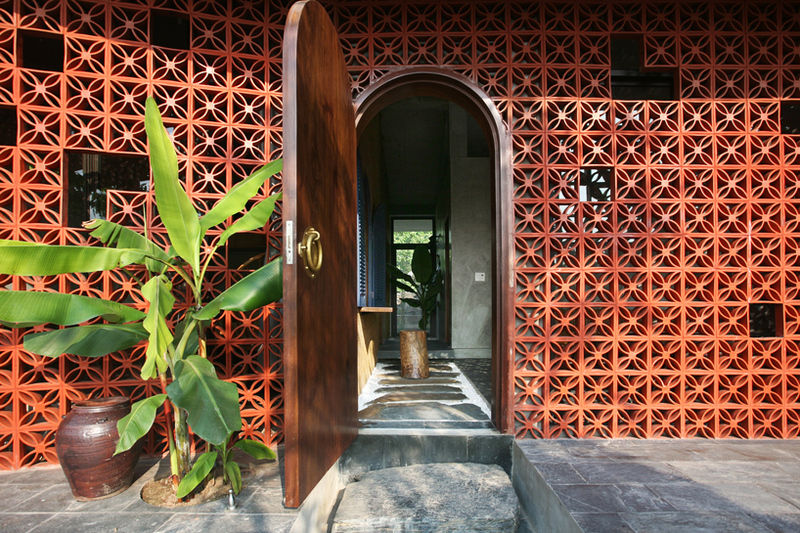 But don’t I have something big and bold here at home that might appreciate roomier quarters? Indeed I do, a 6-foot tall Pseudobombax ellipticum, the Shaving Brush Tree. 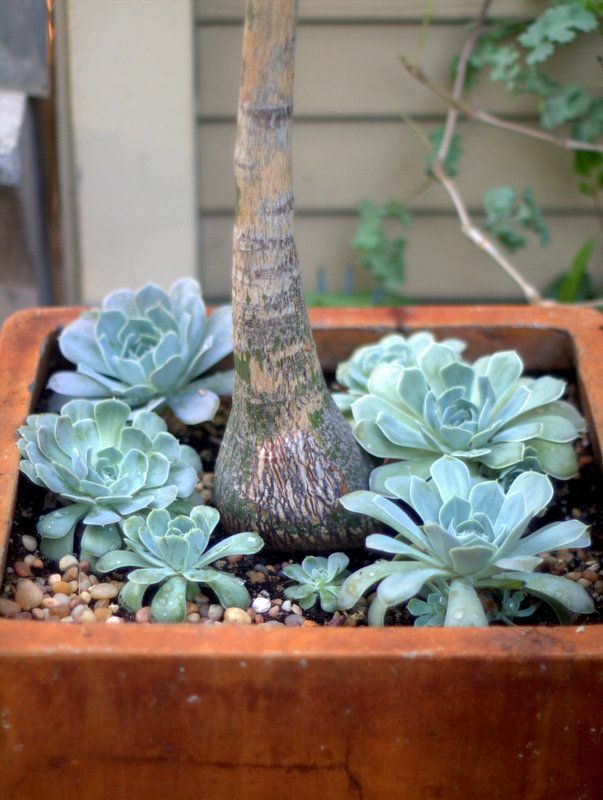 That’s its swollen trunk/caudex surrounded by the Mexican snowball, Echeveria elegans, that I gathered up from elsewhere in the garden. Maybe I’ll see the first flowers from the Shaving Brush Tree this spring. 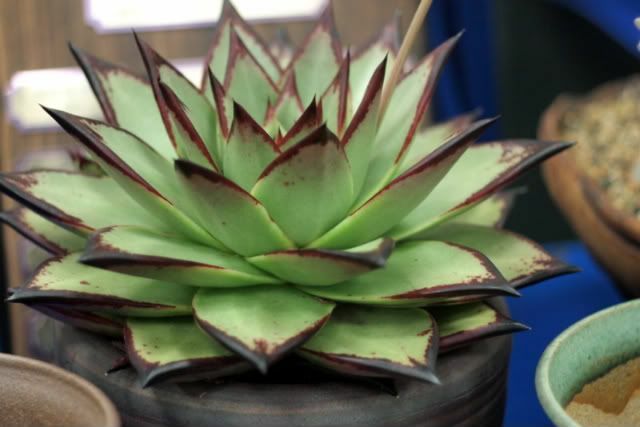 ‘Lipstick,’ ‘Red Edge,’ ‘Maria,’ ‘Romeo’ — browsing nurseries and plant sales I’ve come across lots of named forms of this most agave-like of echeverias. 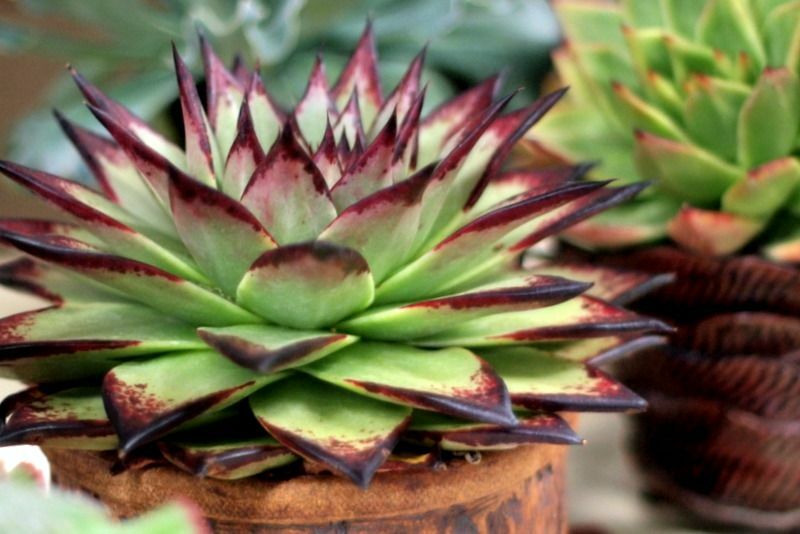 This page from the World of Succulents has descriptions and photos of these varieties and many more. 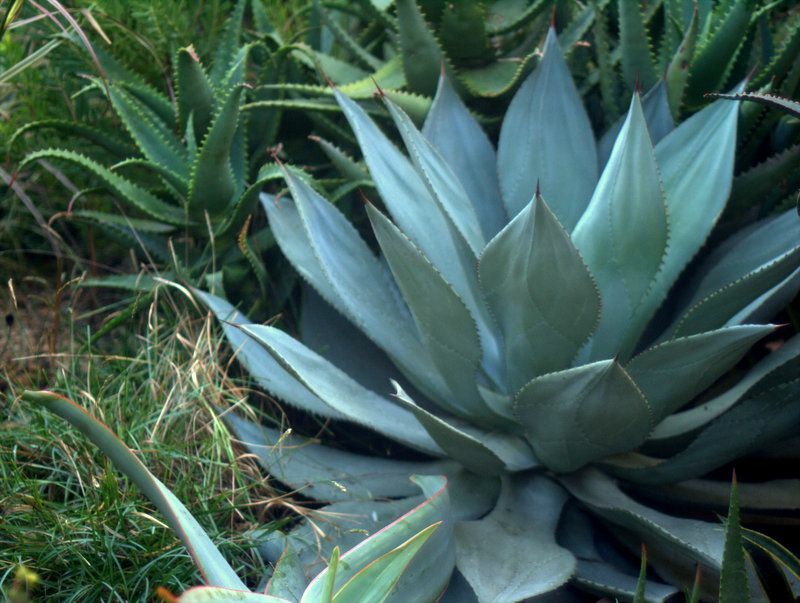 I’ve yet to hear anyone use the common names Molded Wax or Molded Wax Agave, but I have to admit the names are fitting. Some forms are quick multipliers, sometimes annoyingly so, while the most sought after (‘Ebony’) are stubborn singletons and therefore very pricy. 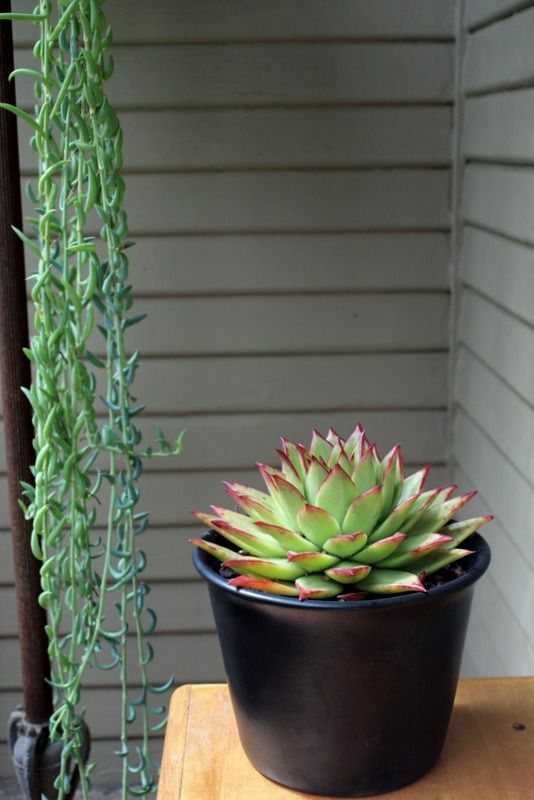 In pots I have a ‘Red Edge’ and a cross with colorata named ‘Mexican Giant,’ which is nothing near as robust as its name suggests and has required serious coddling to keep alive. An ‘Ebony’ with pups, CSSA Inter-City show August 2015. 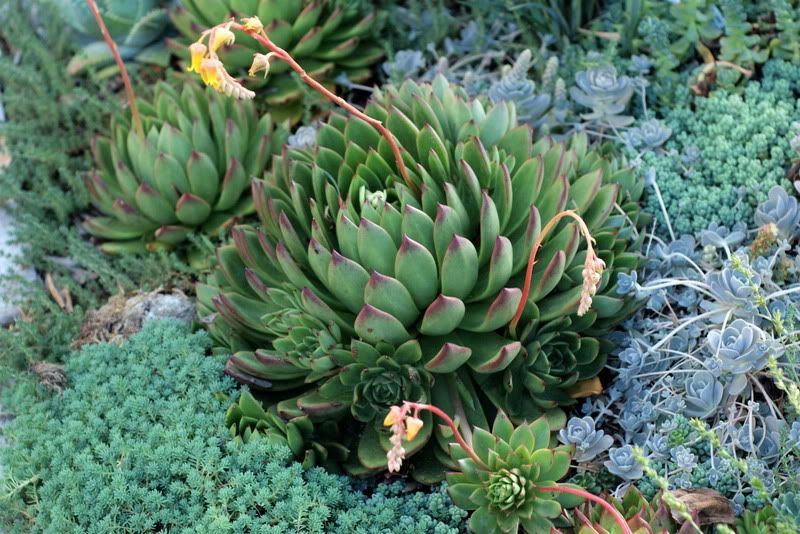 As good in landscapes as in containers, Echeveria agavoides var. 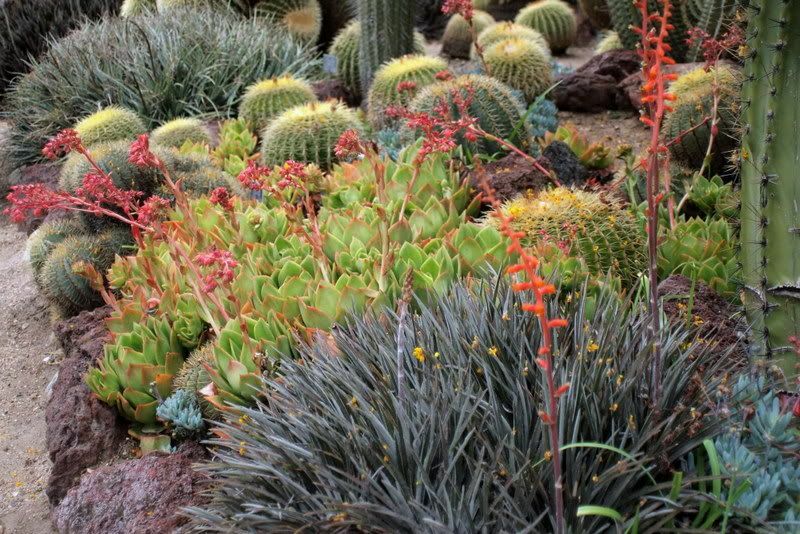 prolifera shown here at the Huntington with dyckia and barrel cactus. In my garden April 2011. 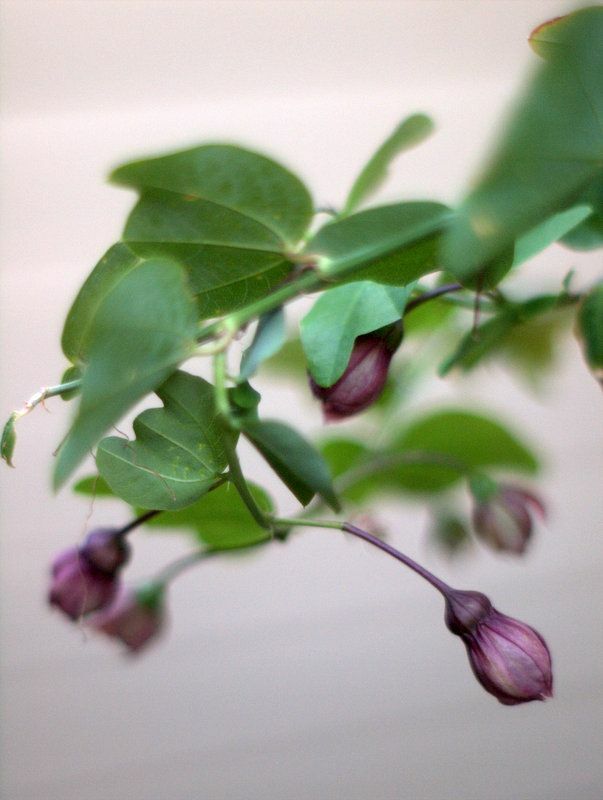 Native to rocky outcroppings in several states of Mexico, it flourishes in my garden’s amended clay. Those in the ground are unnamed, fast-pupping, passalong plants. 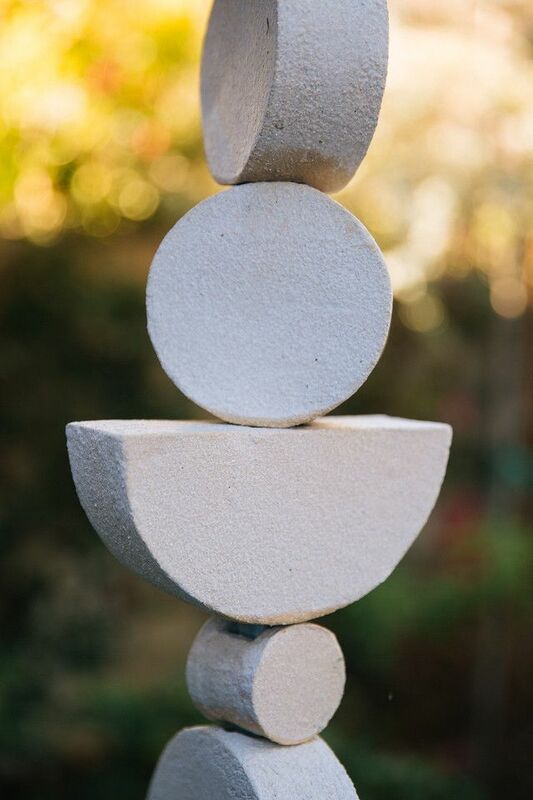 In a local garden, brushed by a restio, it anchors a column by brimming over in a shallow bowl. 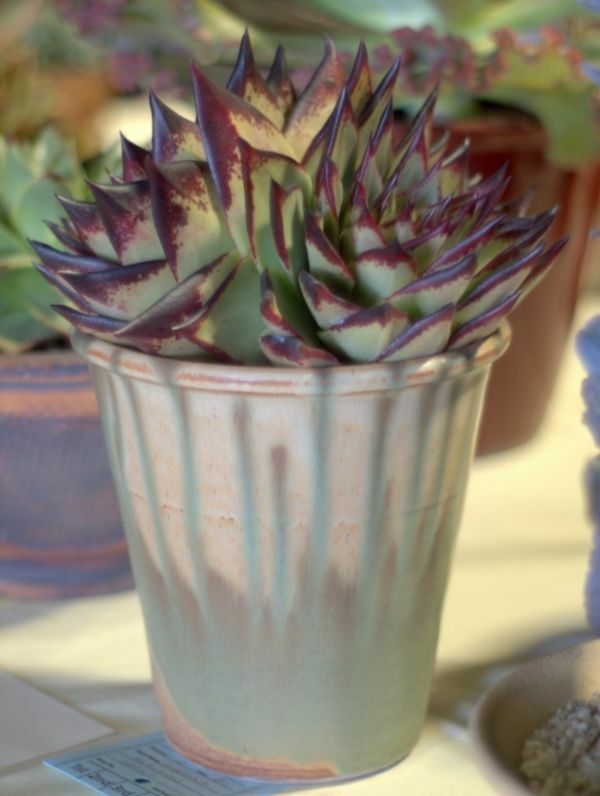 But also plays well with other succulents. The perfect rosette can be a fleeting effect. Crowded with pups is more the usual. 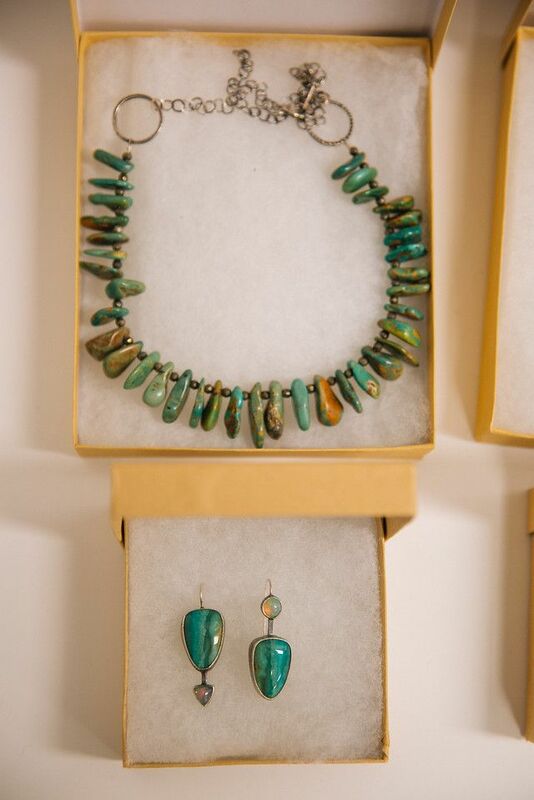 Some pretty pictures for Thursday. 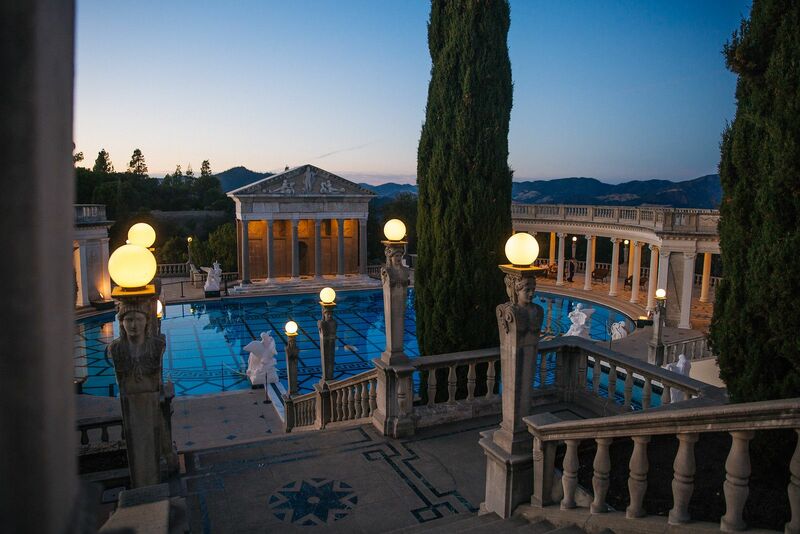 The Neptune Pool at Hearst Castle in San Simeon, California, closed since 2014 to address leaks of up to 5,000 gallons of water a day, is open for business again. 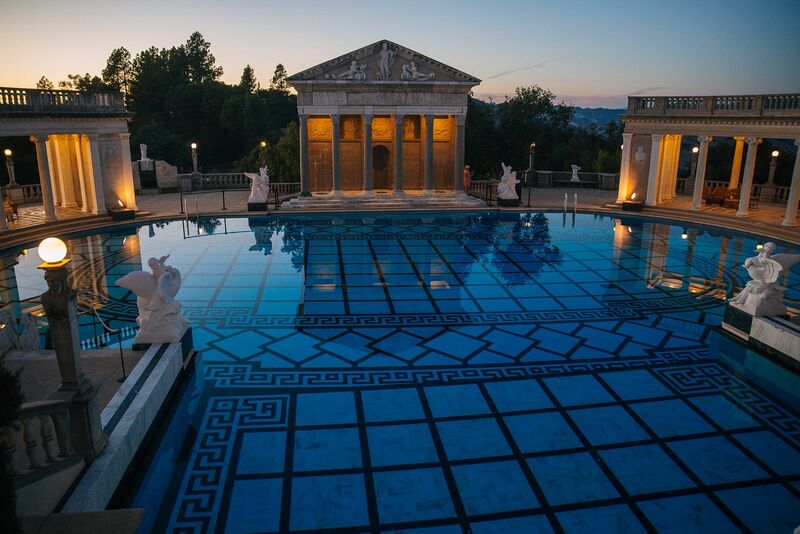 But if you want to make some waves in this pool, it’ll cost you. You can talk to these folks about arranging a swim. When I saw these photos, I had to rewatch Citizen Kane again. And reread Pauline Kael’s Raising Kane — Orson Welle’s film legacy was in dire need of resuscitation after the Olympian lightning bolts and obstacles Hearst threw at the film on its release in 1941, when Hearst was 78 and Welles just 25. When you control the newspapers, it’s fairly easy to limit a film’s reach and a director’s career. The Central Coast is a gorgeous destination for an autumn road trip. 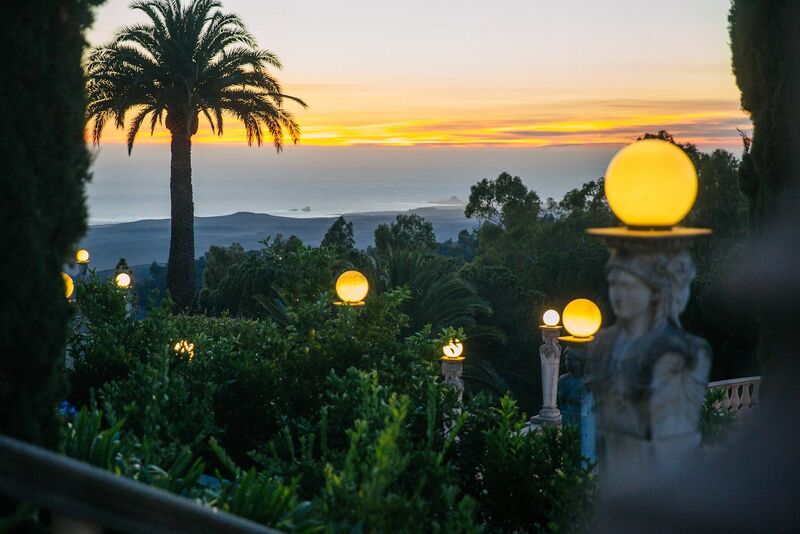 Viewing the Pacific Ocean from Julia Morgan’s neo-Spanish cathedral is an indelible sight. The density of antiquities, mosaics, carpets, statuary overloads the brain like a drug. And for pondering power, dynastic wealth, the futility of attempts to quash criticism and dissent, there’s nothing else like a visit to this California State Park. 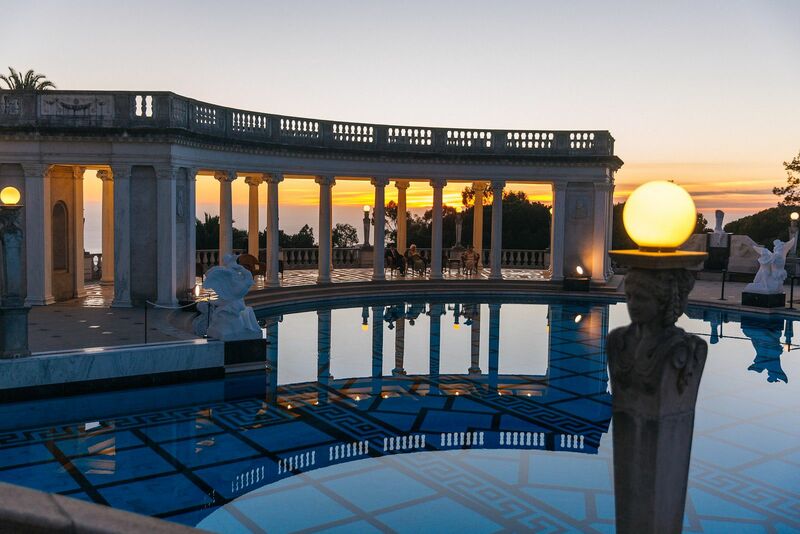 Despite Hearst’s iron-fisted attempts to control the narrative, ironically, he will now forever be enshrined with Welles at San Simeon. 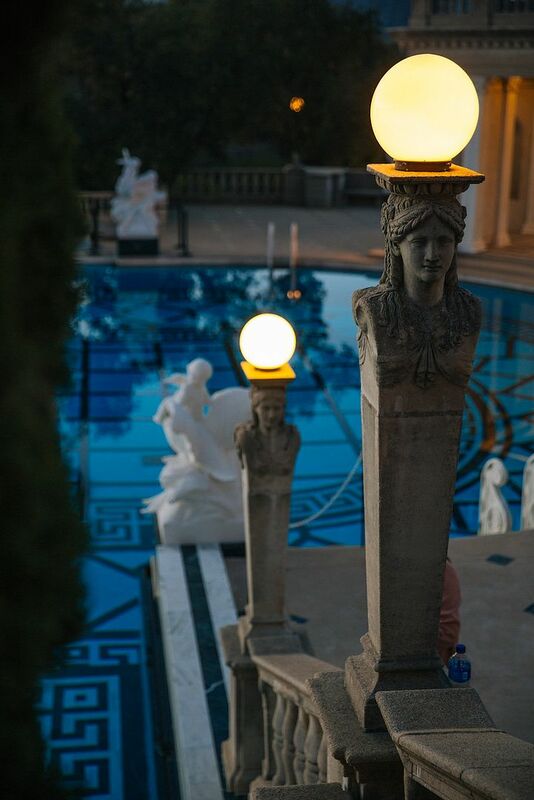 And whatever Hearst thought of the film, its themes are as timeless as the caryotids and just as relevant today. The salvia order from Flowers by the Sea arrived early in the week in exceptional condition and has been potted up. Included in the order were the two above, Salvia discolor ‘Purple Bracts’ in the foreground, Salvia patens ‘Guanajuato’ in the back, as well as the hybrid ‘Raspberry Truffle’ and S. gesneriiflora ‘Tequila.’ Because every one of them is a big bruiser in the ground (aside from S. discolor), they will all be grown in containers, eventually much larger than these, and will be cut back hard in early spring, shuffled to the back wall during summer, root-pruned if necessary, kept watered, fed, and pinched until fall, when they will be brought out again ablaze in blue, purple, and magenta trumpets. That’s the plan anyway. Autumn plans are so much easier than summer implementation. It’s been so long since I’ve grown the big salvias from Mexico that I forget the reasons I stopped growing them — hence the journal entry — apart from their oversize dimensions and keeping them irrigated in the garden all summer until fall bloom. 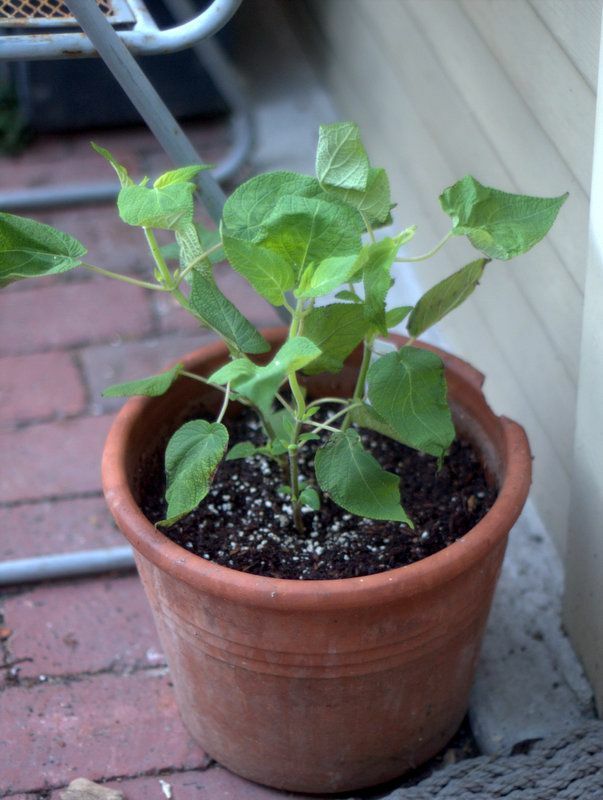 Growing them in containers is the new strategy. Salvia gesneriiflora ‘Tequila,’ leaves still wrinkled from transport. 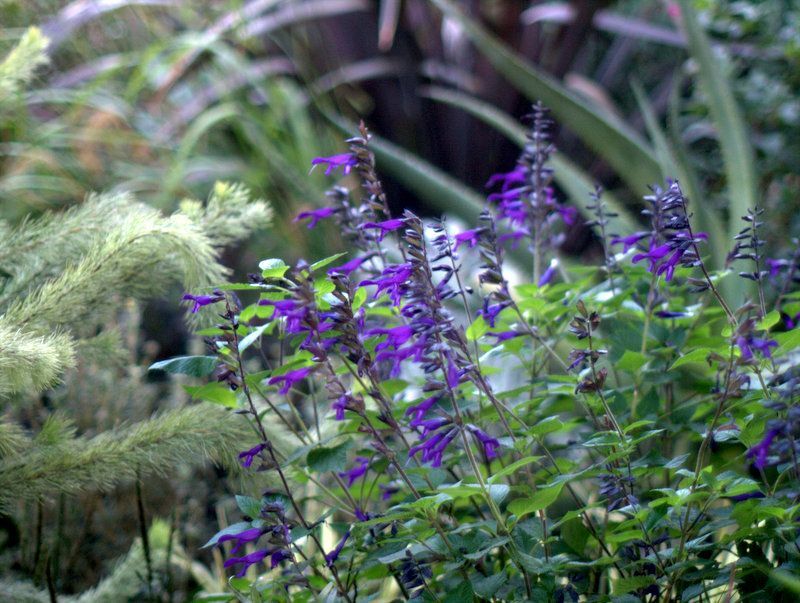 The salvia infatuation ebbs and flows but never entirely goes away. 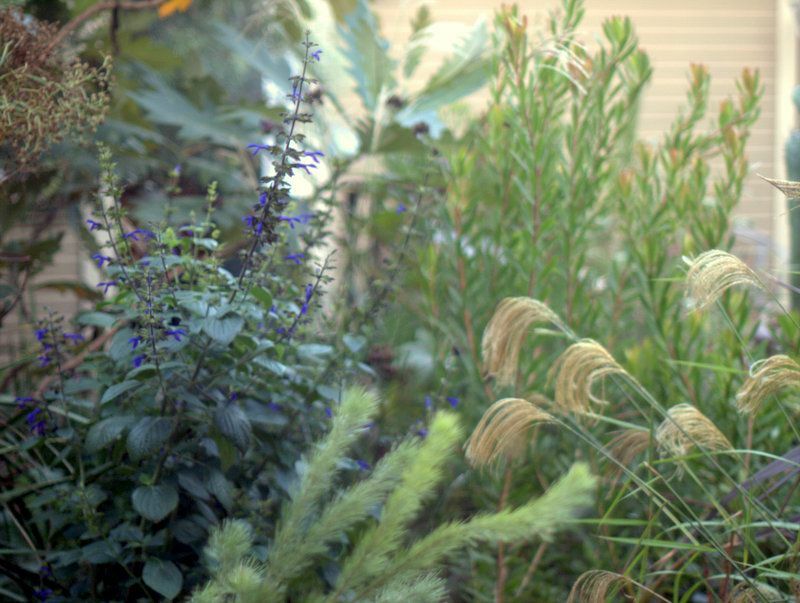 This nostalgic episode was triggered by finding a beautiful 3-foot specimen of Salvia mexicana ‘Limelight’ grown by Native Sons at a local nursery and me realizing it’s time again to take advantage of one of the singular perks of having a garden in Southern California, e.g., winter-blooming salvias. Plus, no doubt it’s a form of garden comfort food for me. Plus, at the moment I can use a good distraction. All of these are reputed to bloom fall/winter here in zone 10. 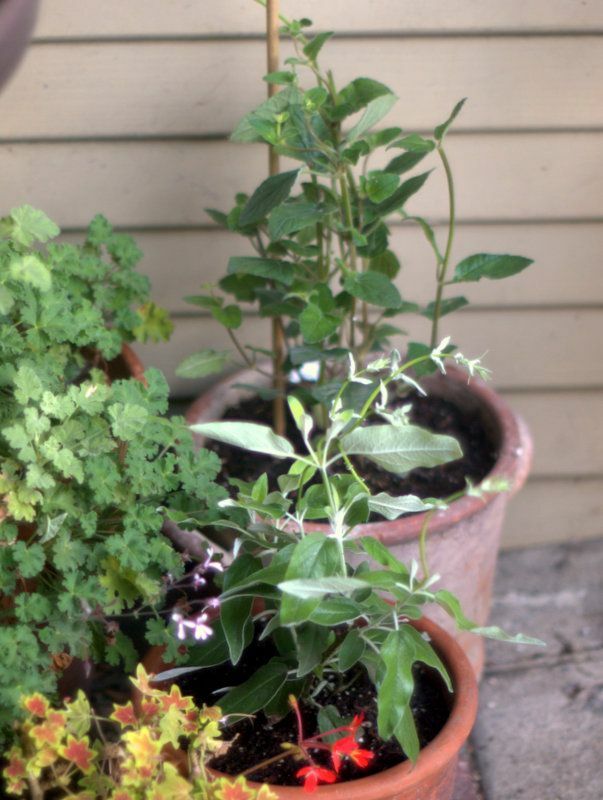 Slipping containers in amongst the dry garden shrubs and succulents or on the patio seems for now to be the best use of resources rather than attempting to give the entire garden the water the salvias need. Watching the hummingbirds’ crush on the salvias, the slanting autumn light outlining halos on everything it brushes — I love everything about this spin of the axis. 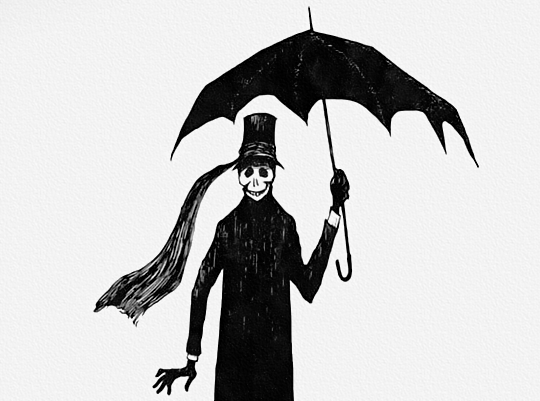 But it’s not all sunshine and dreamy light. 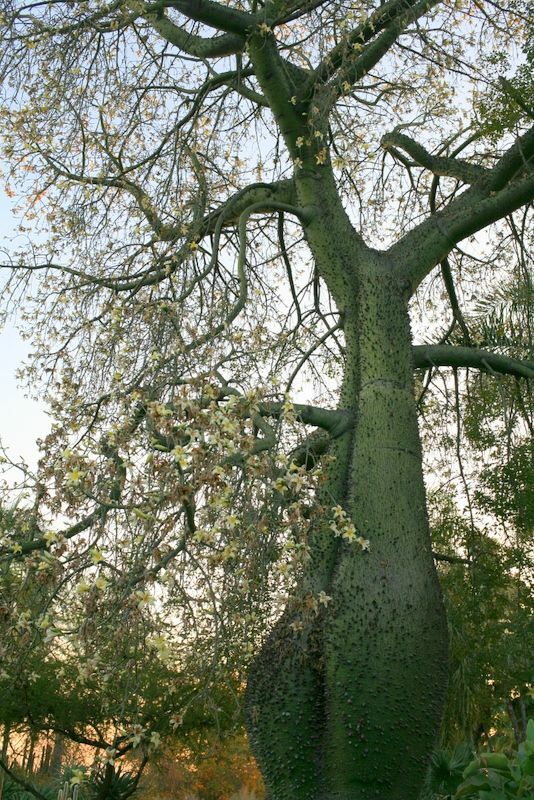 The damage that the dry, hot Santa Ana winds can do should never be underestimated. Which is what I did when I left the bitter cassava exposed to the Santa Ana’s full blast. I felt like an absolute idiot, but I noted when I next visited the nursery again that their stock looked denuded exactly like mine. 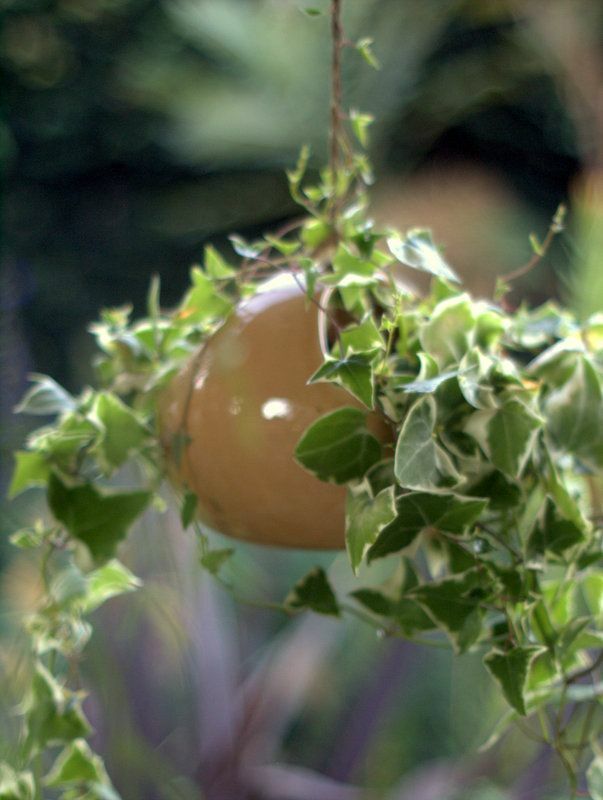 Another small-garden hack. 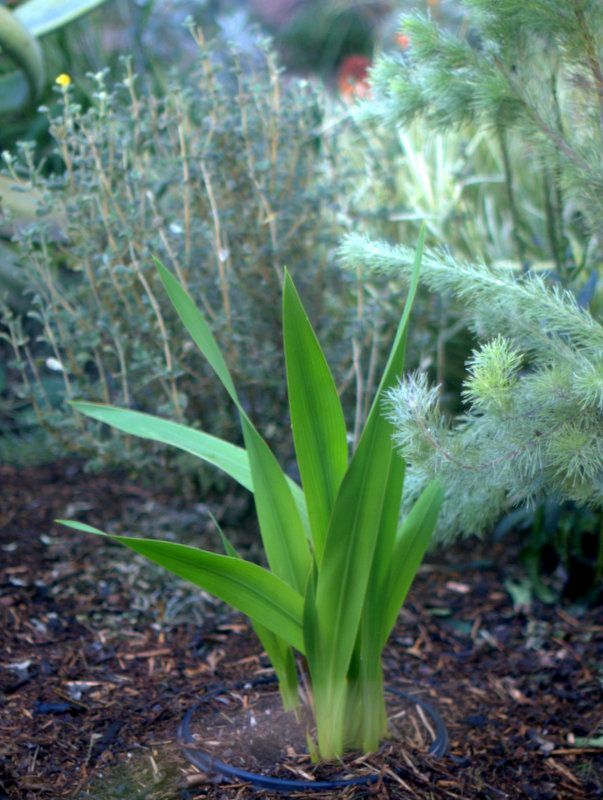 The same thinking is behind sinking this pot of watsonia in the ground. An unknown peachy-flowered species brought home from a Strybing sale, it makes a big clump of enormous leaves. After spring bloom the pot will be lifted and something else will take its place. Or not. Lots of mulch was made from garden clippings ground up in the shredder, and it’s been applied liberally to open areas and paths. I love freshly laid mulch. And so do the raccoons, who visited this area immediately after mulch was laid down looking for grubs, breaking quite a few branches of that coastal woolybush. I know instantly upon opening the back door in the morning whether the garden received night visitors, because the cat’s water bowl will be muddy and need rinsing. None of the budding aloe bloom stalks were broken, thank heavens. 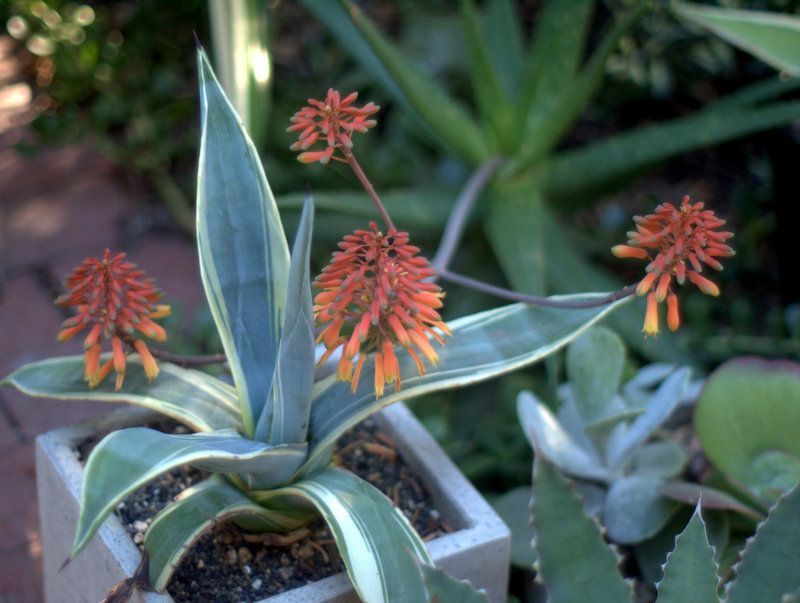 These are Aloe scobinifolia. 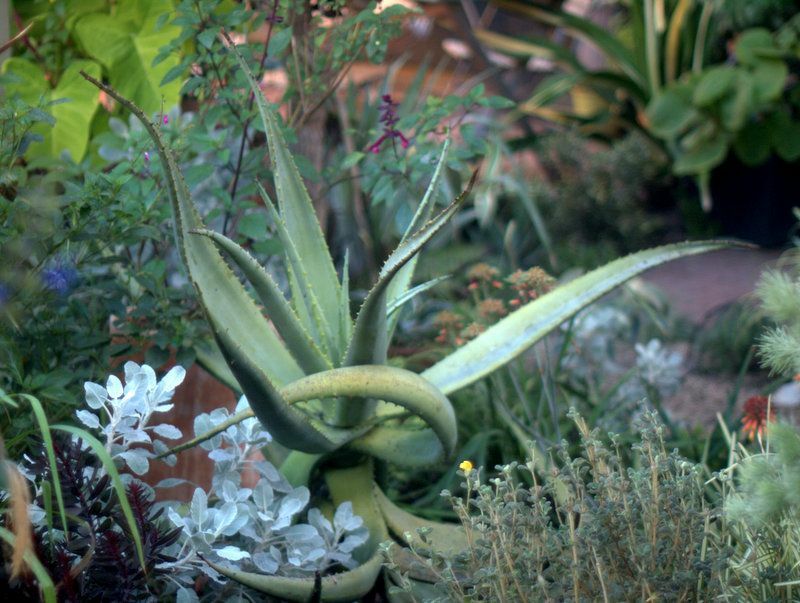 Perhaps the aloe blooms are somewhat protected from trampling and breakage by this whirling dervish of an aloe hybrid, possibly a ferox cross. 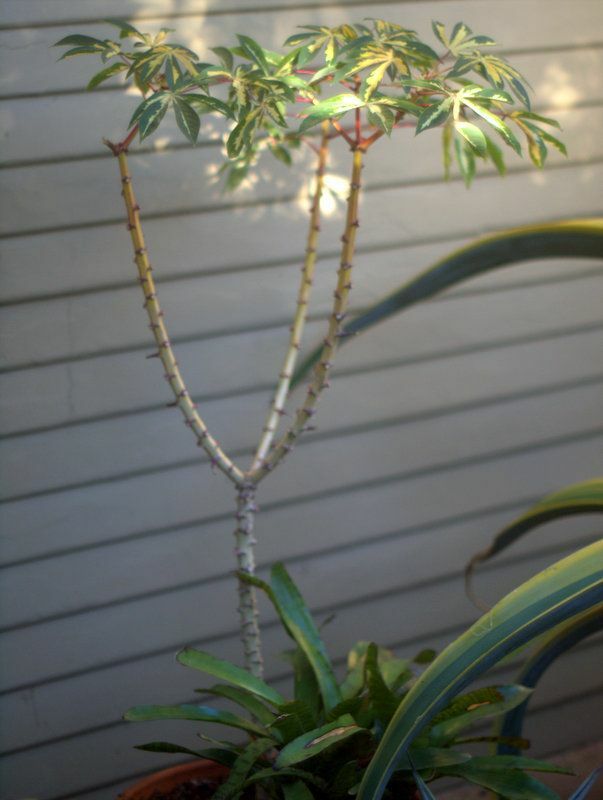 It’s developing a trunk and will eventually rise up over the plantings, no longer crossing swords with other plants and generally getting in everyone’s grille. It will be a lovely, tall, twisting dervish then. 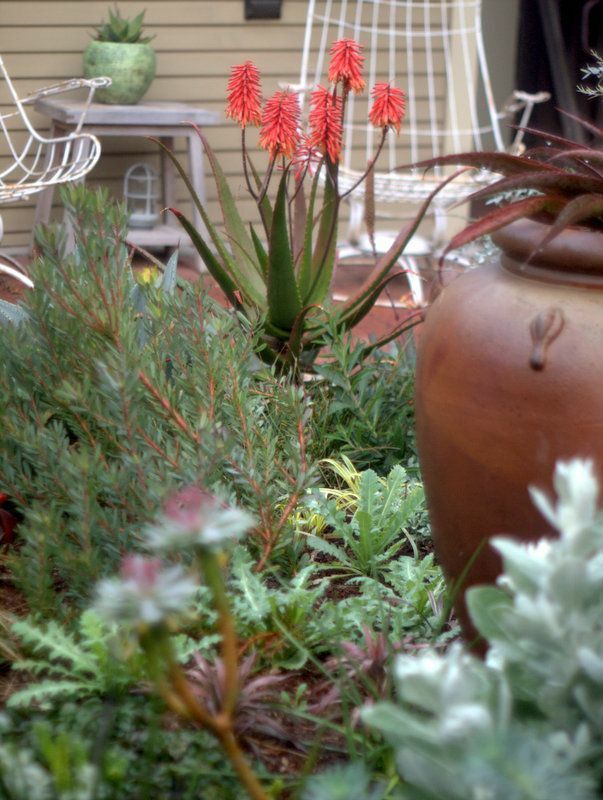 That is, if it manages to avoid an attack by the dreaded aloe mite. 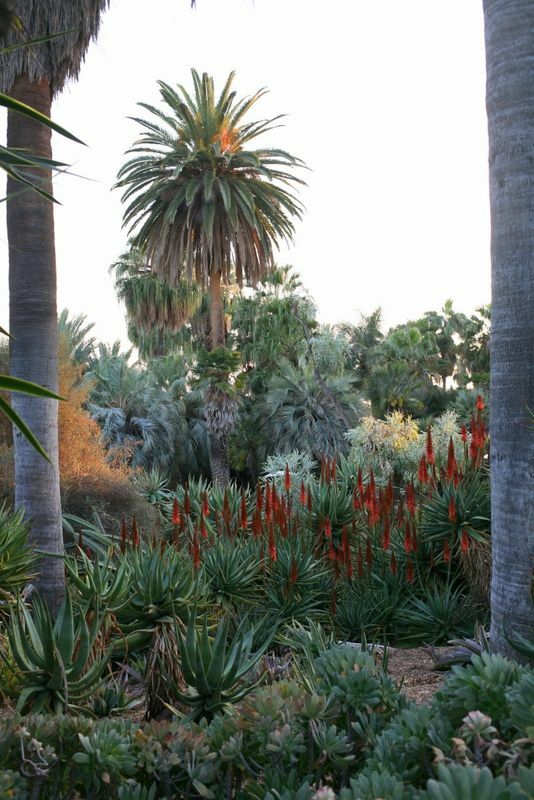 There’s no honest discussion of growing aloes in Southern California without including mention of their arch nemesis, the villain Aceria aloinis aka aloe mite. 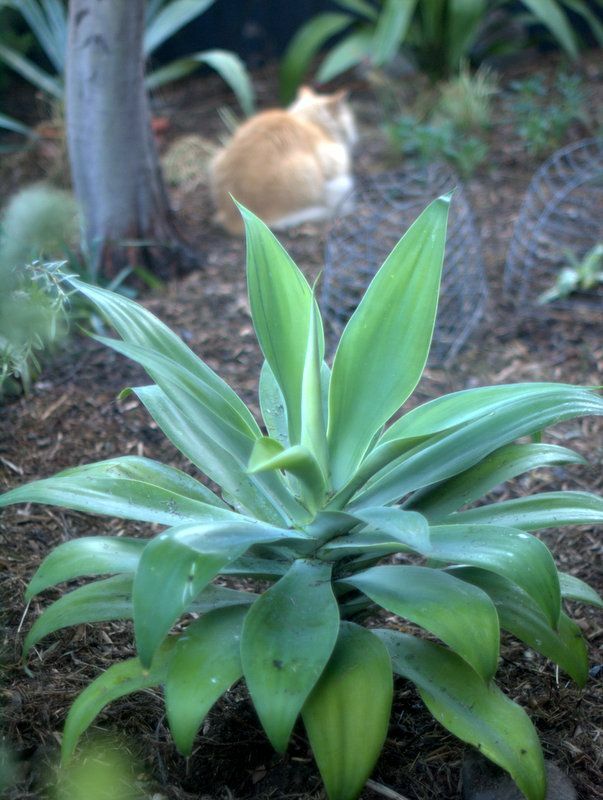 The tree aloe ‘Goliath’ is still in treatment, recovery uncertain, and today I opted to remove a big Aloe cameronii after noting the distinctive thickening and micro-ruffling of leaf edges near the center, the arrival of which seemed to coincide with the cooler nights. Some growers refer to it as aloe cancer. The disfiguring galls build up to conceal and protect the nefarious activities of the mites. 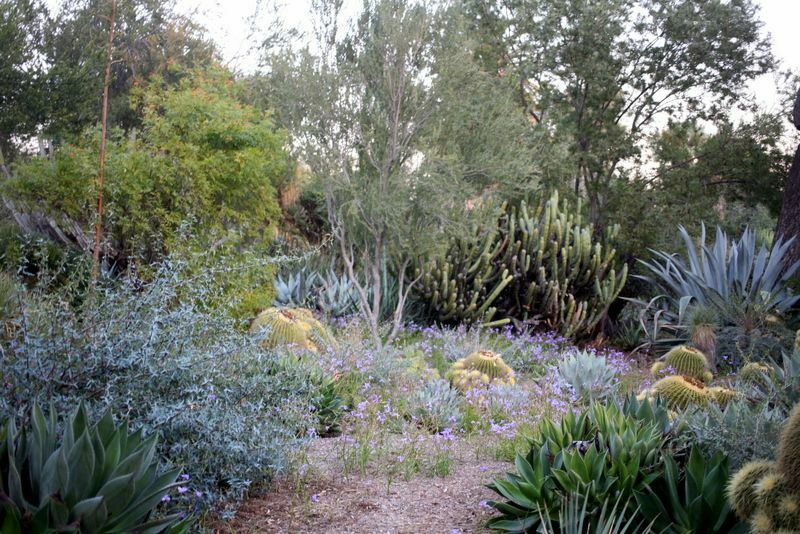 Because of my habitual overplanting, Aloe cameronii’s absence is barely perceptible, but just a few hours earlier it was arising out of that clump of sesleria to the left of Agave ‘Dragon Toes.’ Aloe elgonica behind the agave appears to be uninfected for now. Perhaps it’s resistant. Luckily I have a clean, yellow-flowering Aloe cameronii in the garden elsewhere as consolation. Most heartbreaking of all was the attack on the marlothii x peglerae hybrid, one of the most beautiful plants I’ve grown. I opted to try to save it, taking off most of its disfigured leaves. And I really don’t, because there are already so many containers. 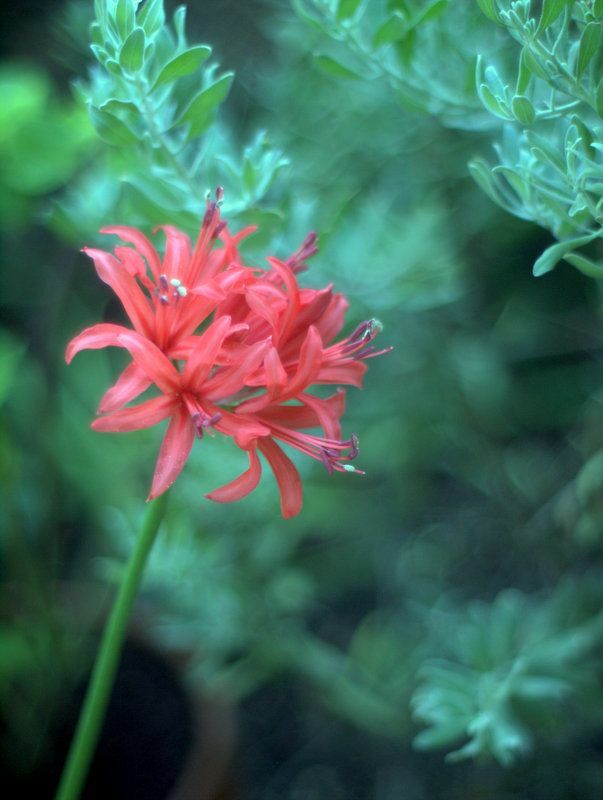 My one pot of nerines is throwing three bloom stalks. Summer-dry bulbs from South Africa, they’re a good fit for LA. They were initially planted in the front gravel garden, but I’ve noted the bulbs fatten up faster for best bloom in container conditions. The cooler nights are bringing out some ruddy color again on Agave geminiflora, which is kept in a container so it rises above surrounding plants. The stock tank winter vegetable garden was planted this week, the first purposeful use made of this tank I’ve had a few years. 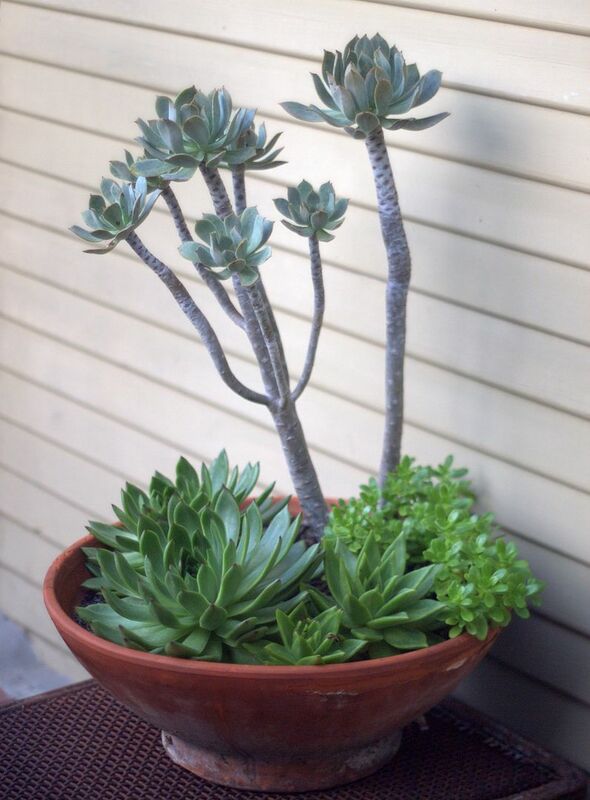 All summer it held odds and ends of cuttings along with summer-stressed aeoniums and other bits of succulents. Basically it became the garden’s junk drawer. Two kinds of broccolini were planted, side-shooting broccolis that don’t form a big central head and that can be picked over a longer period of time. And I’ll probably interplant radishes amongst them, French breakfast and watermelon radishes. 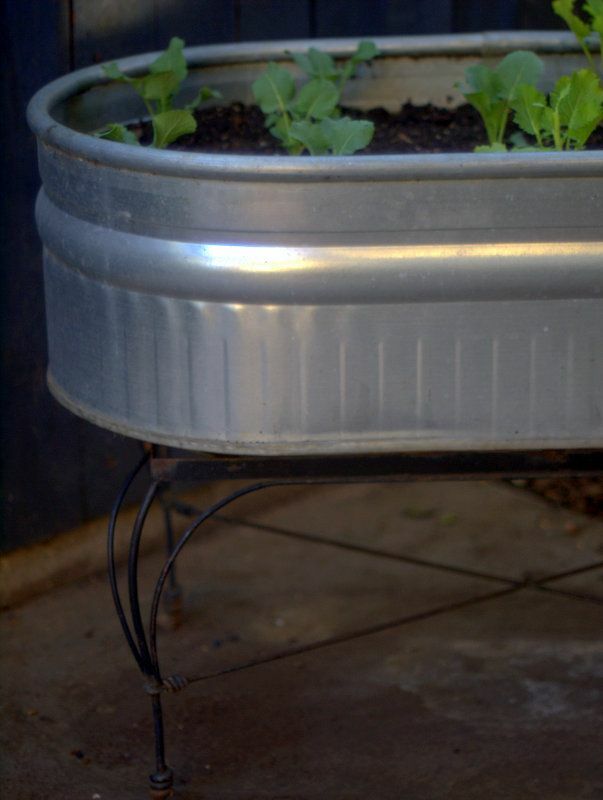 Getting the tank up on this old wrought iron table base exposes the plants to more sun throughout the day. One of the stock tank’s temporary residents moved to make room for vegetables was an Agave ‘Kara’s Stripes’ pup that grew to quite a massive size. 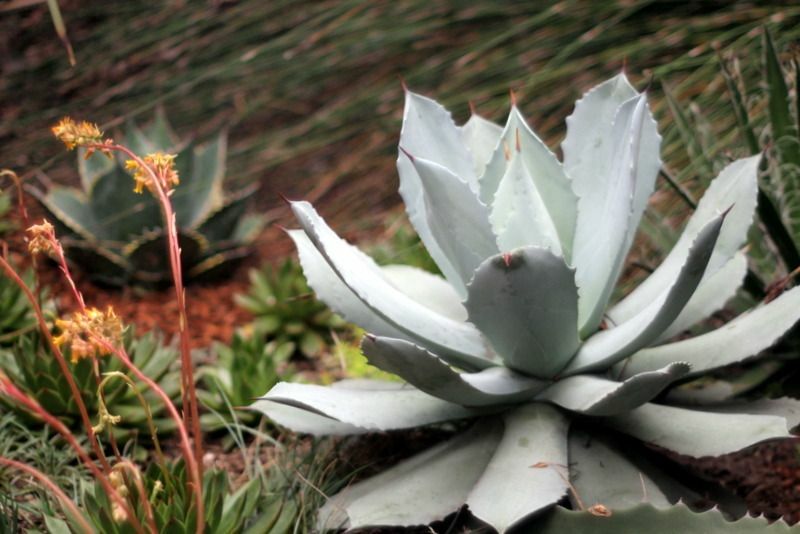 More and more agaves are migrating to the area under the fernleaf acacia, since they don’t mind the root competition and dry soil. A couple of ‘Joe Hoaks’ are being protected by those baskets from lounging felines and/or digging raccoons and possums. 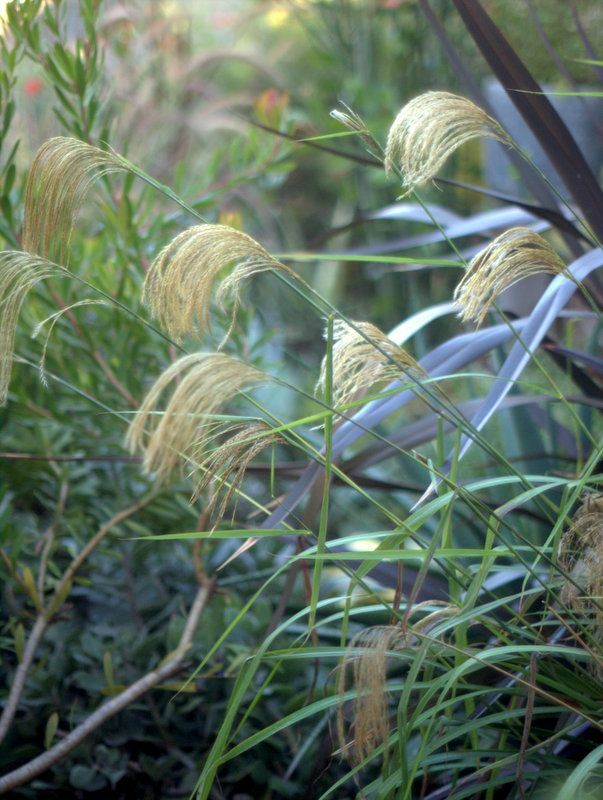 The Miscanthus nepalensis that I mailed home from England’s Great Dixter Plant Fair last fall is proving to be well worth the trouble. An odd ivy lookalike I found while running to the nursery for potting soil, Senecio macroglossus. Passiflora ‘Flying V’ is waking up after a looong summer snooze. Time to put the journal down — enjoy your weekend!